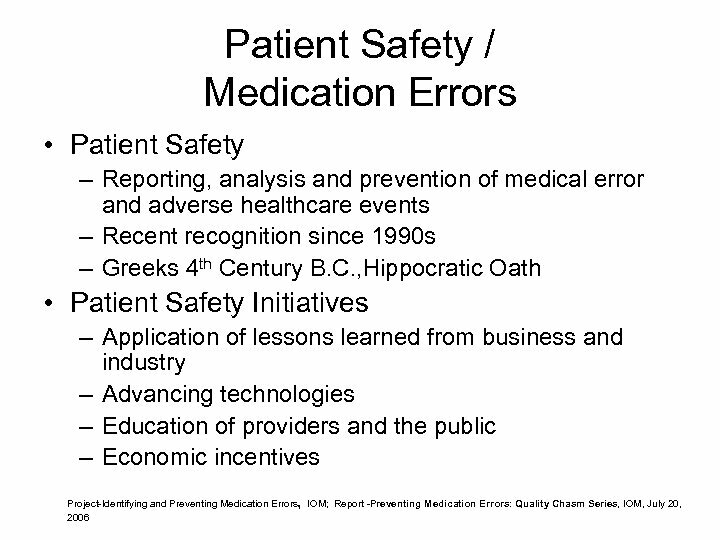 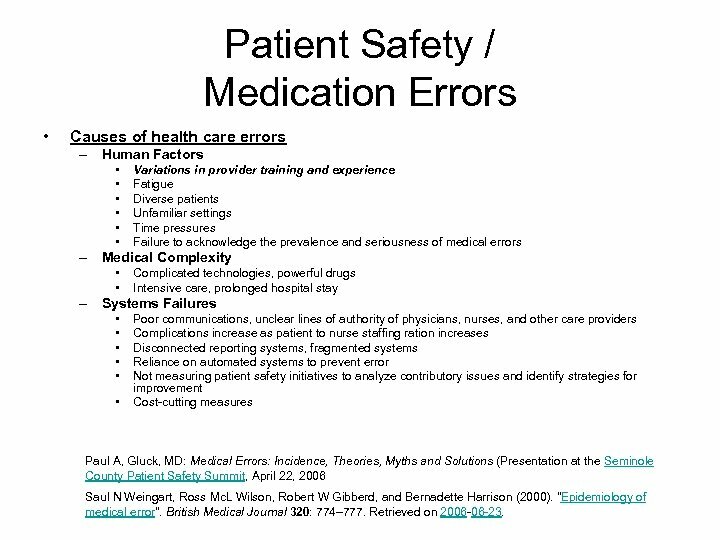 Patient Safety / Medication Errors • Causes of health care errors – Human Factors • • • Variations in provider training and experience Fatigue Diverse patients Unfamiliar settings Time pressures Failure to acknowledge the prevalence and seriousness of medical errors – Medical Complexity • • Complicated technologies, powerful drugs Intensive care, prolonged hospital stay – Systems Failures • • • Poor communications, unclear lines of authority of physicians, nurses, and other care providers Complications increase as patient to nurse staffing ration increases Disconnected reporting systems, fragmented systems Reliance on automated systems to prevent error Not measuring patient safety initiatives to analyze contributory issues and identify strategies for improvement Cost-cutting measures Paul A, Gluck, MD: Medical Errors: Incidence, Theories, Myths and Solutions (Presentation at the Seminole County Patient Safety Summit, April 22, 2006 Saul N Weingart, Ross Mc. 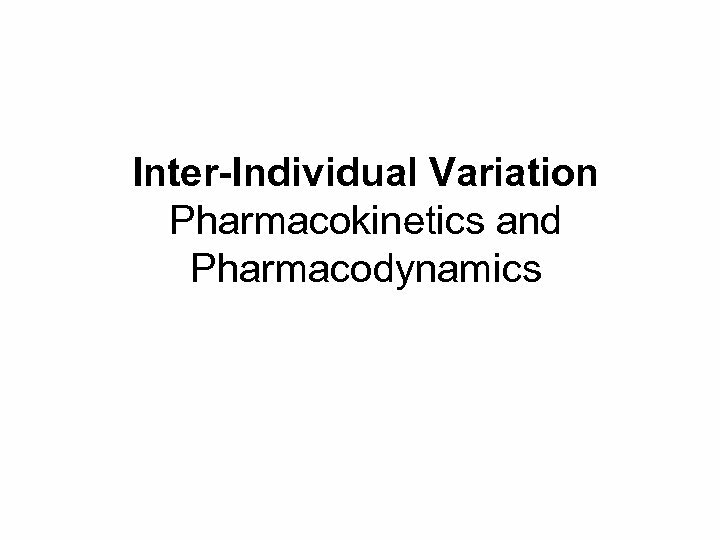 L Wilson, Robert W Gibberd, and Bernadette Harrison (2000). 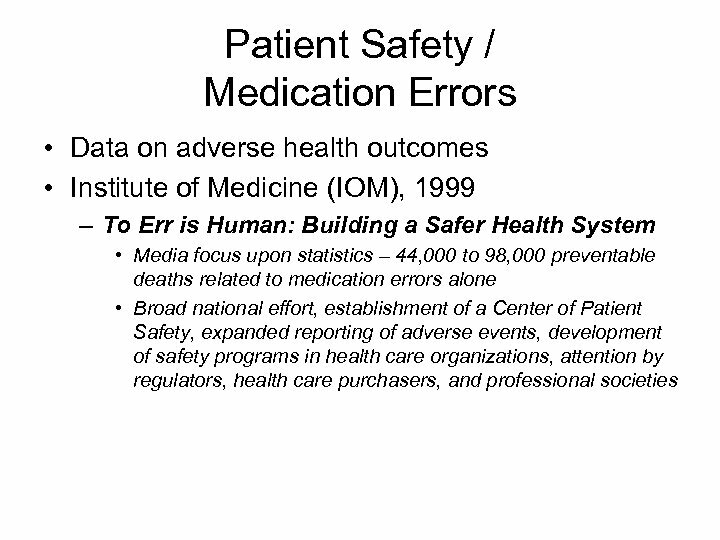 "Epidemiology of medical error". 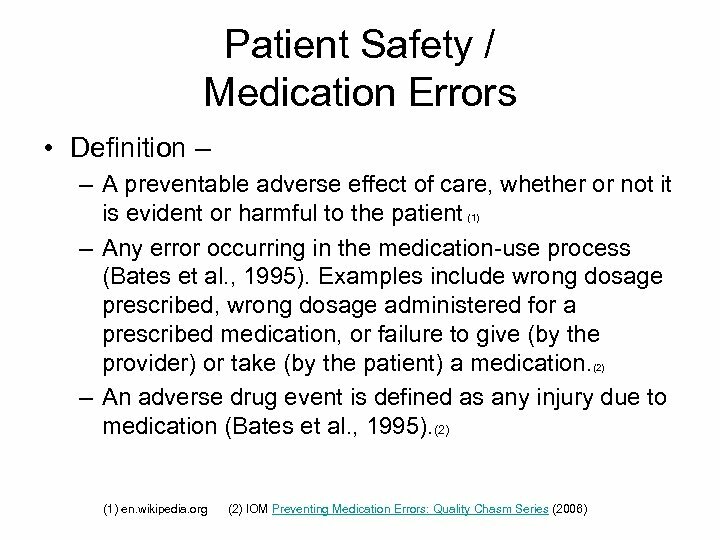 British Medical Journal 320: 774– 777. 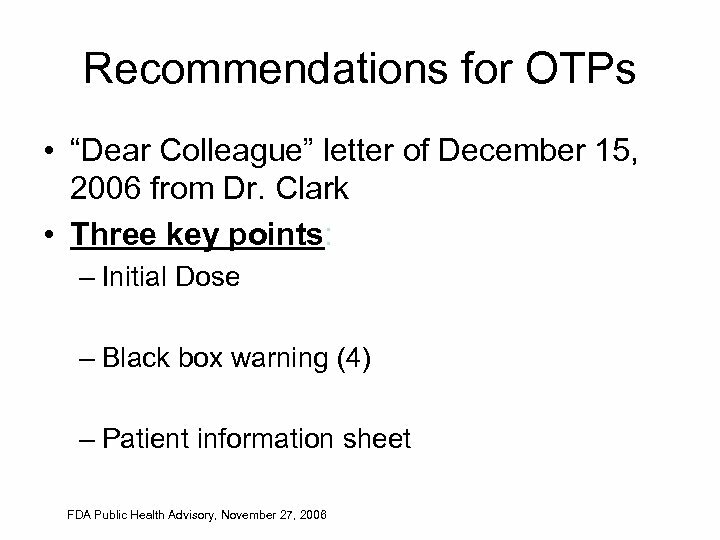 Retrieved on 2006 -06 -23. 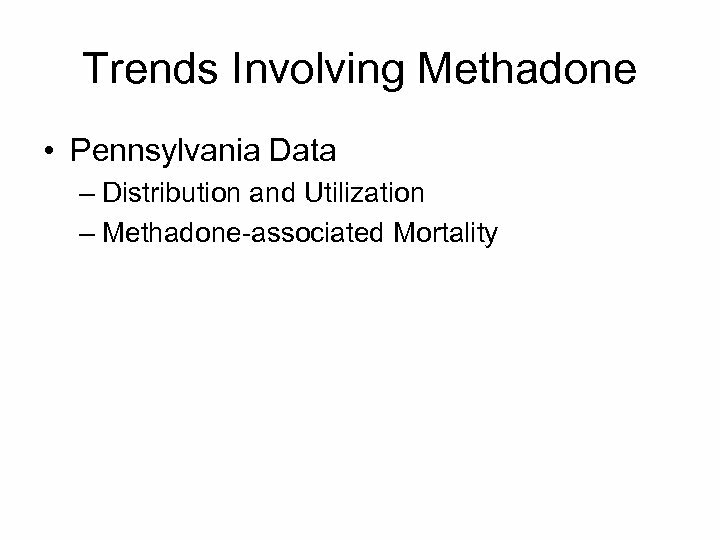 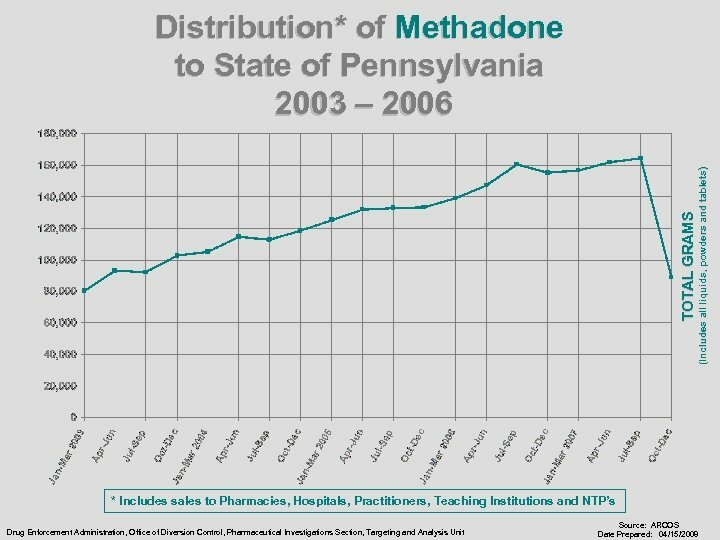 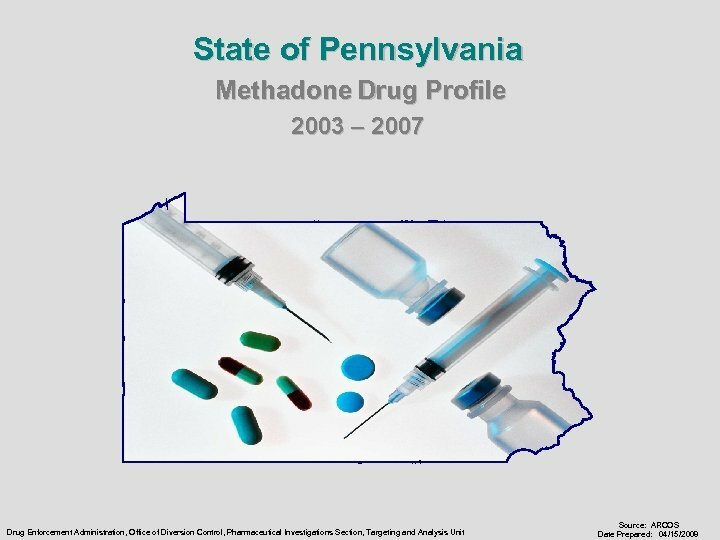 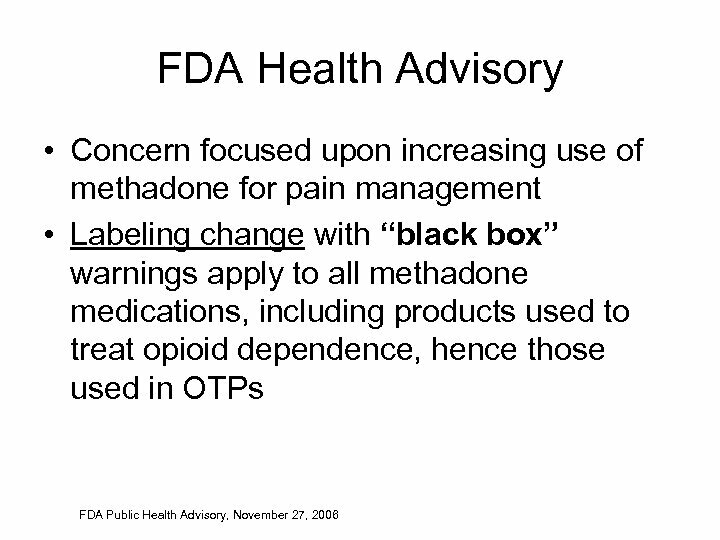 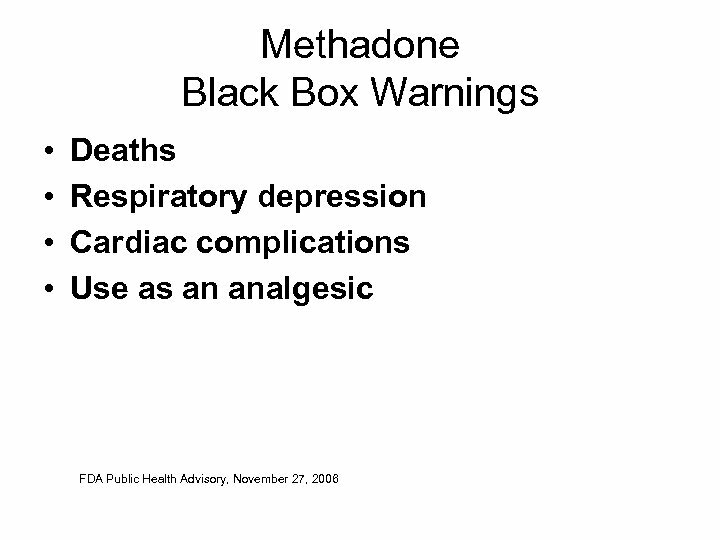 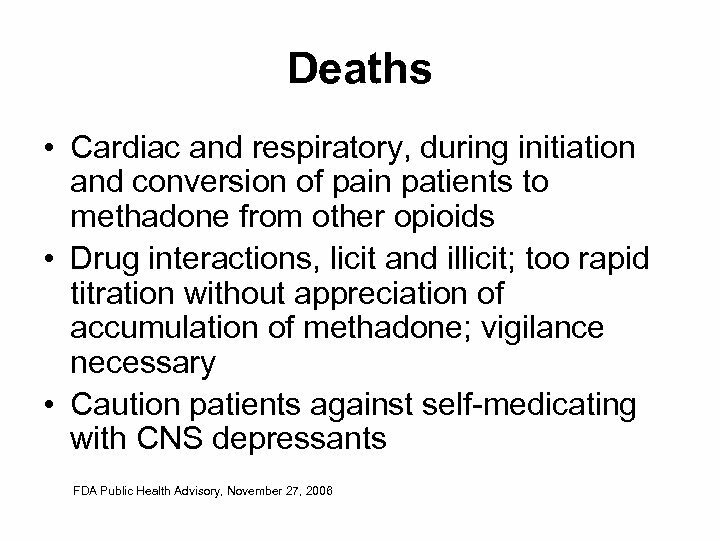 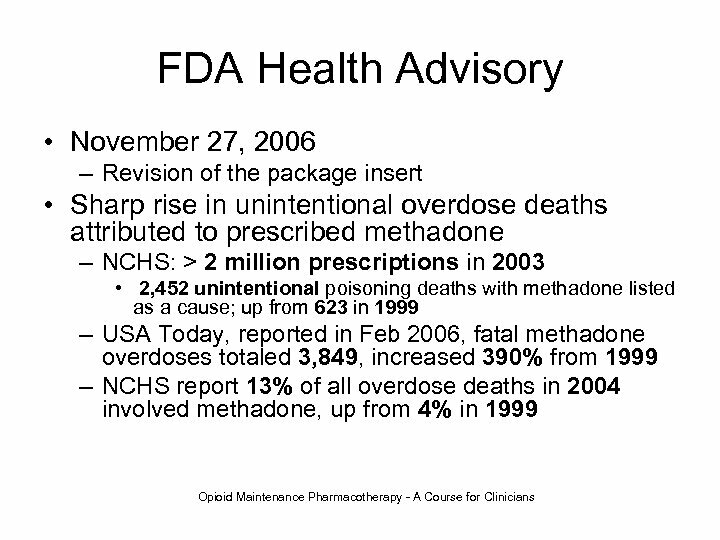 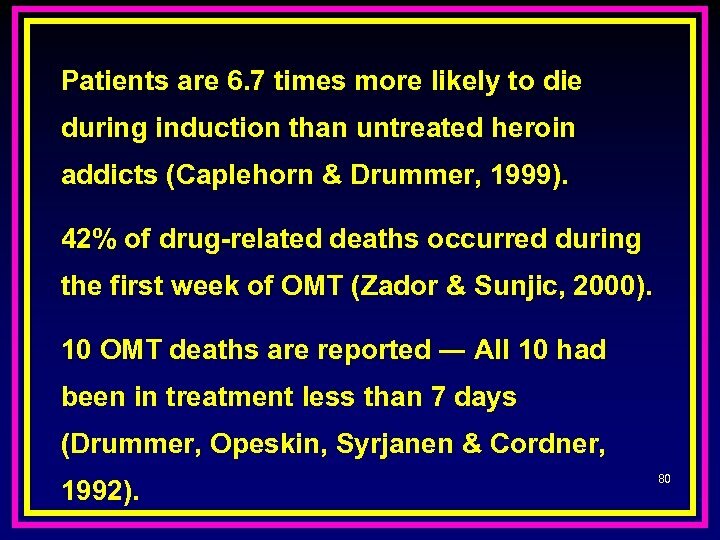 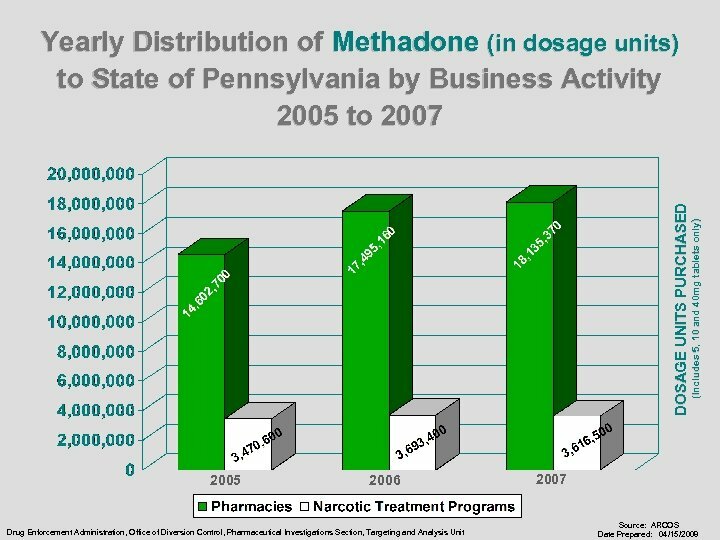 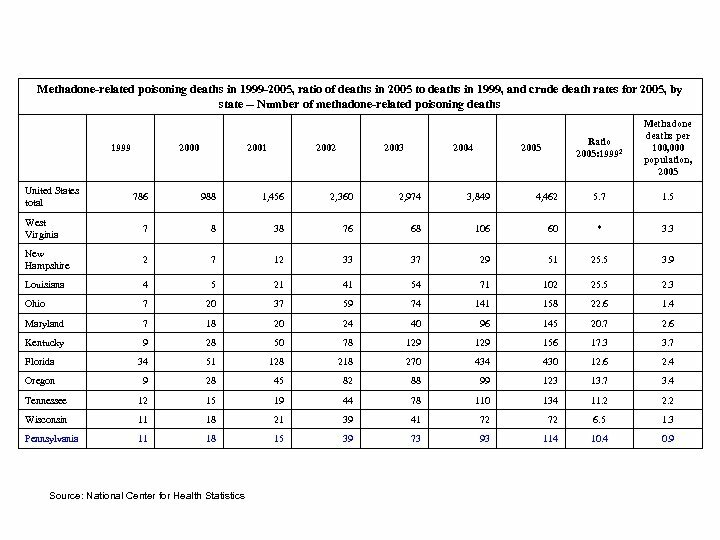 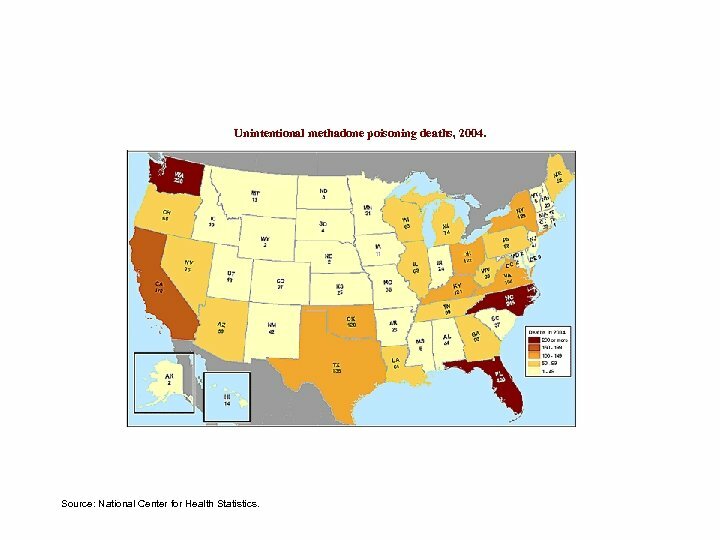 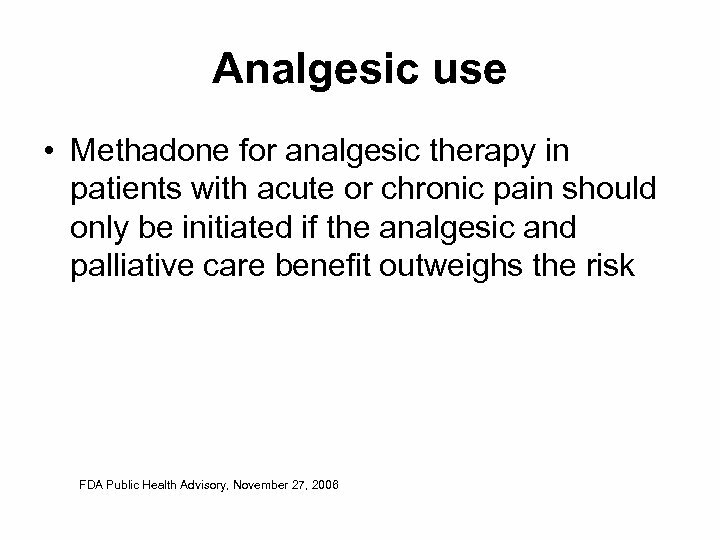 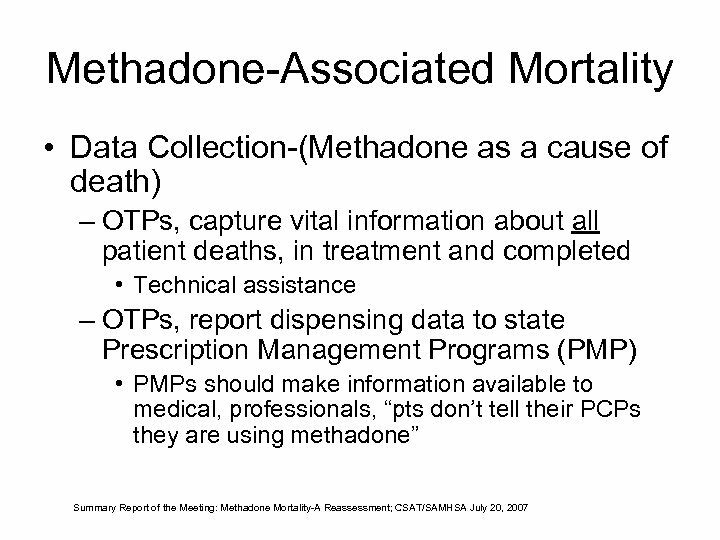 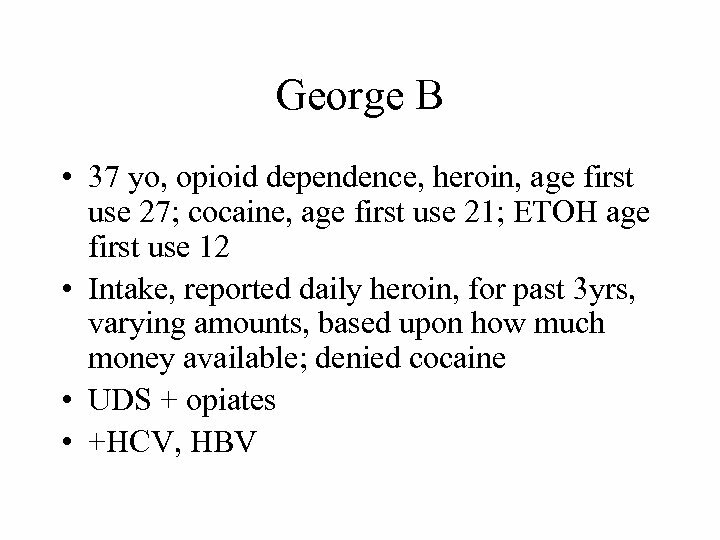 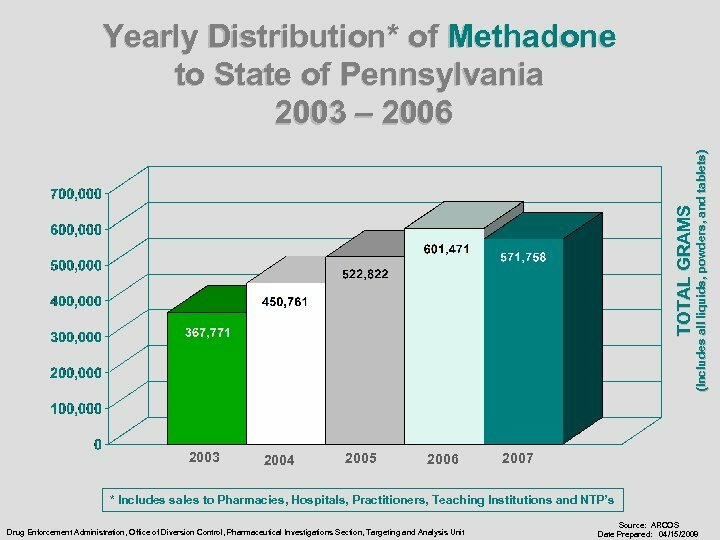 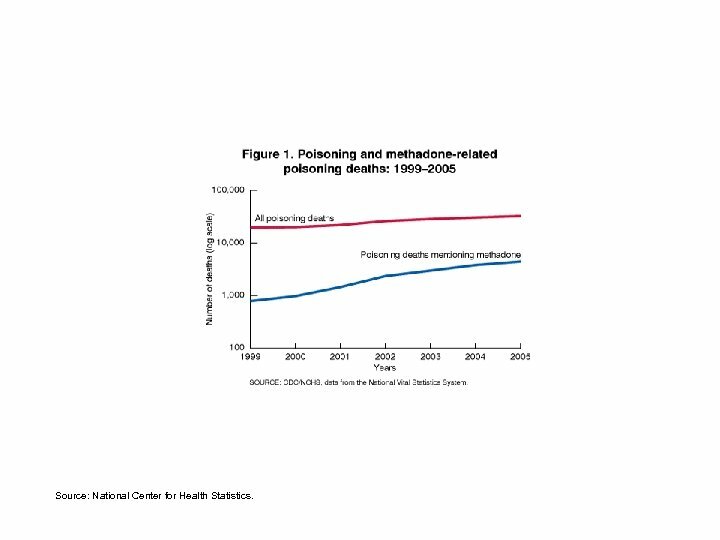 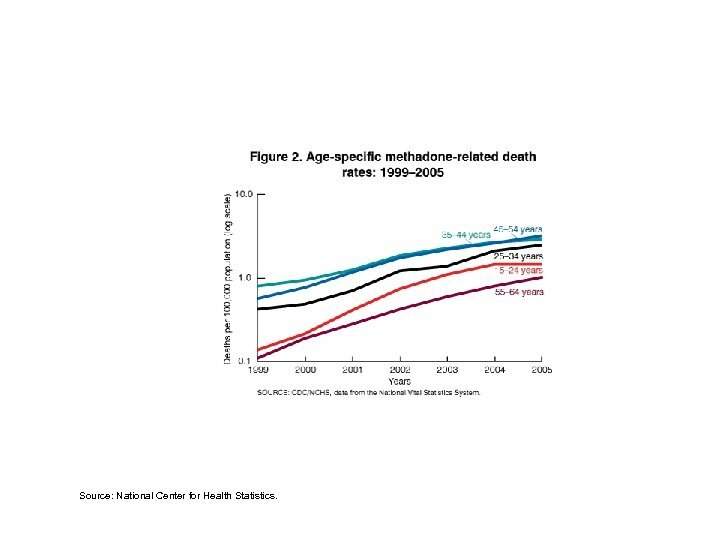 Unintentional methadone poisoning deaths, 2004. 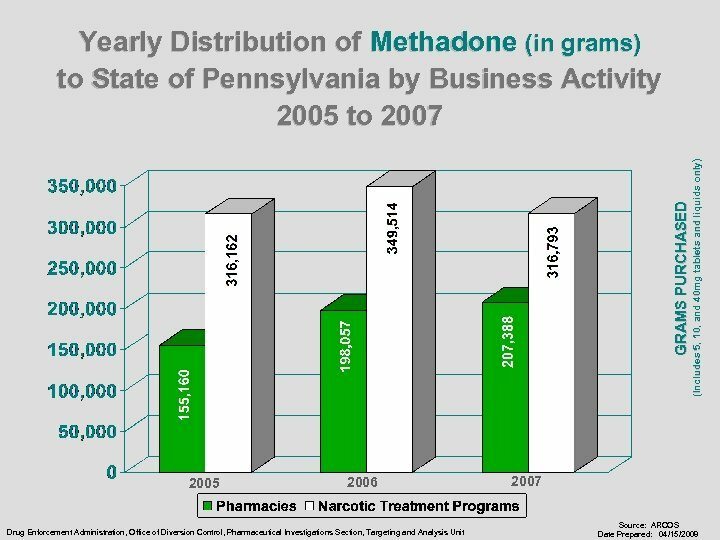 Source: National Center for Health Statistics. 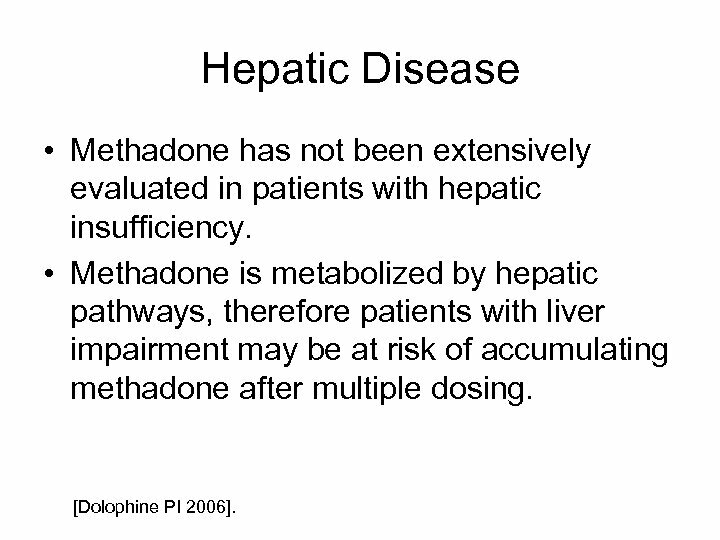 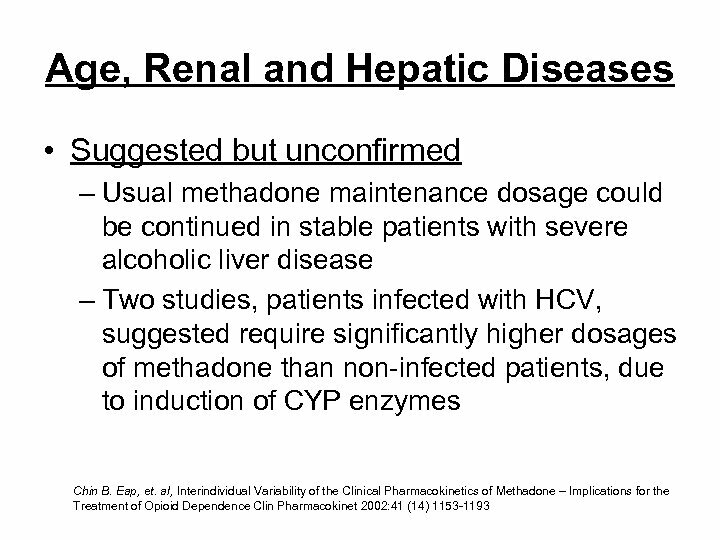 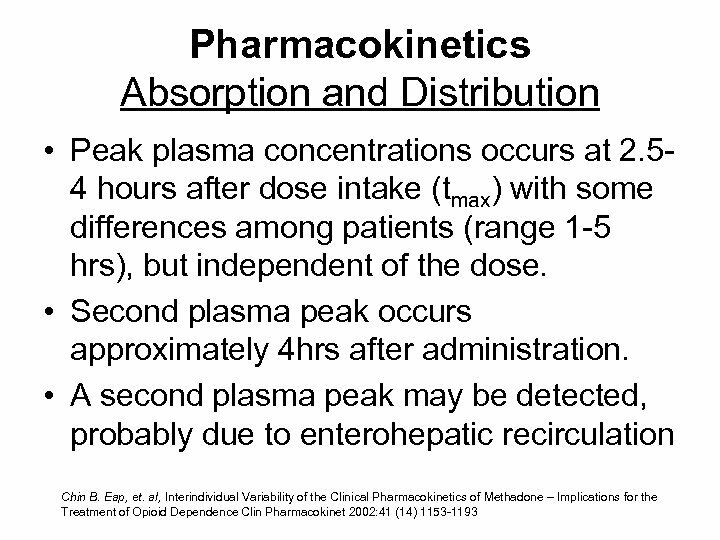 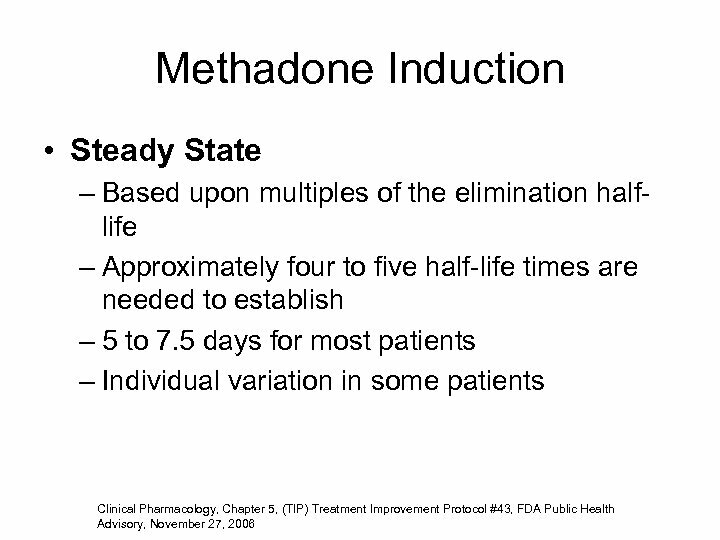 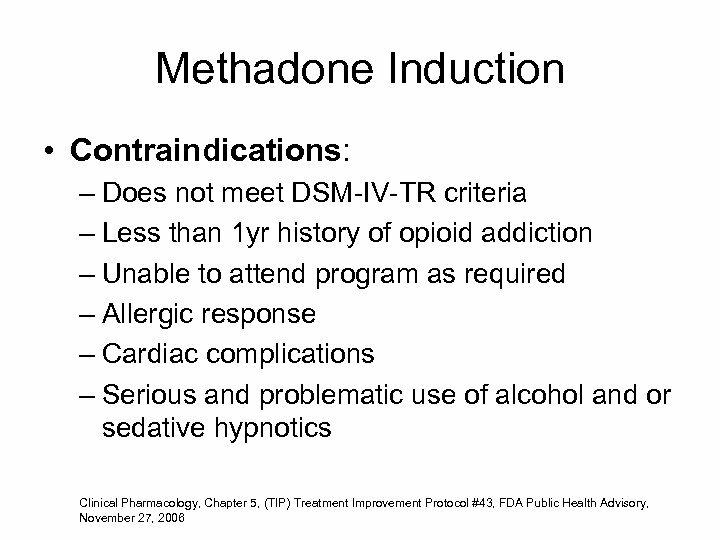 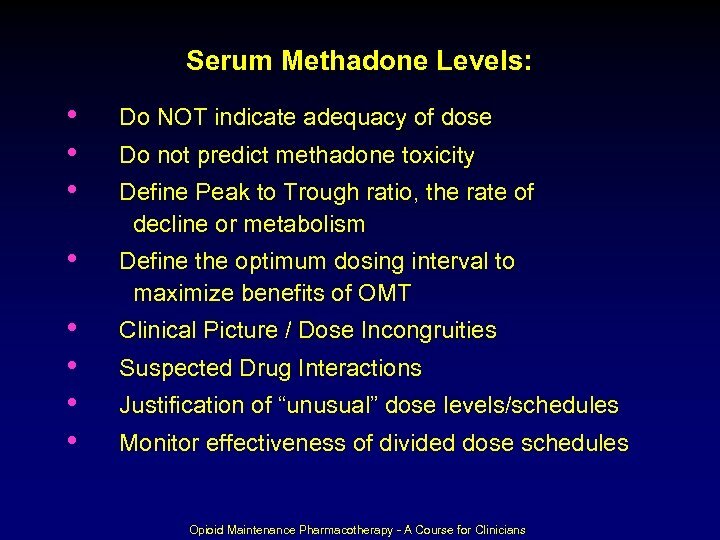 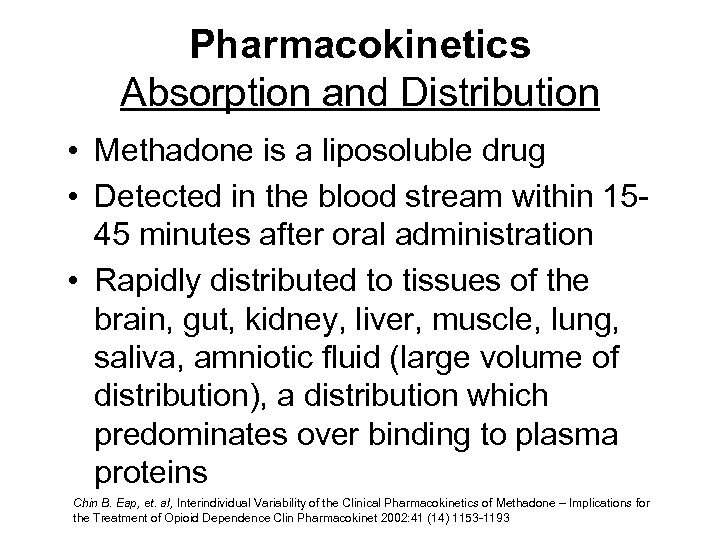 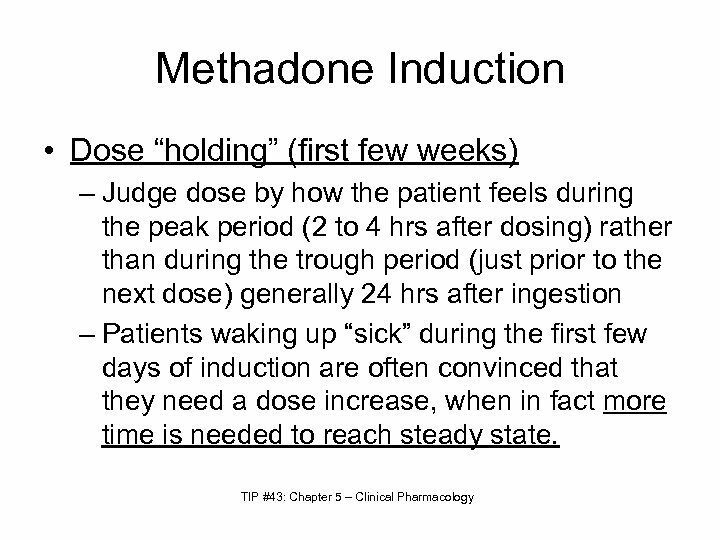 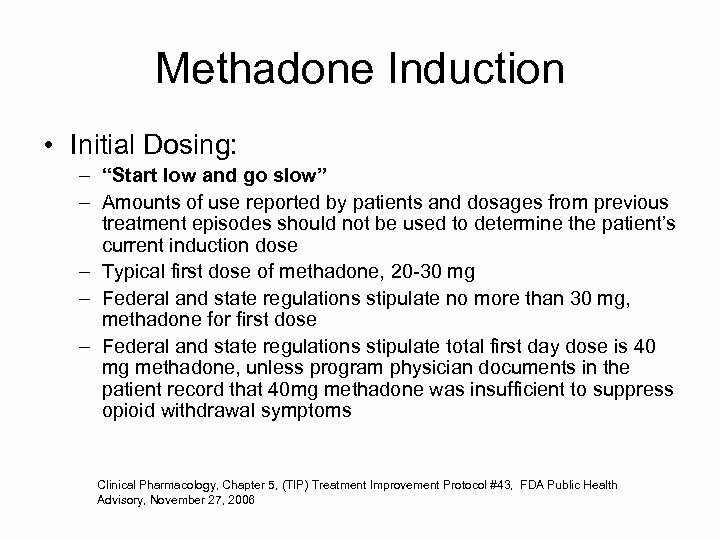 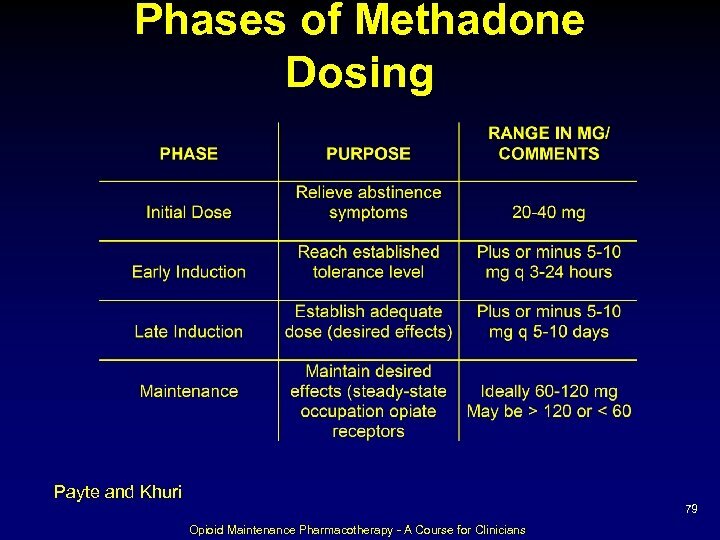 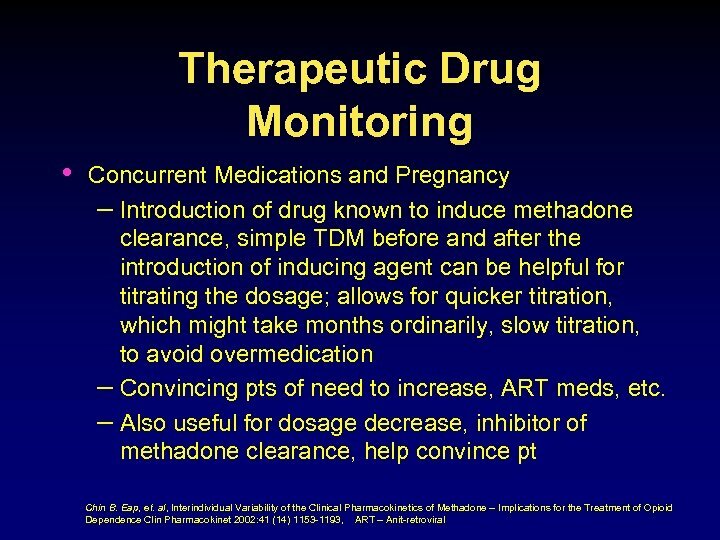 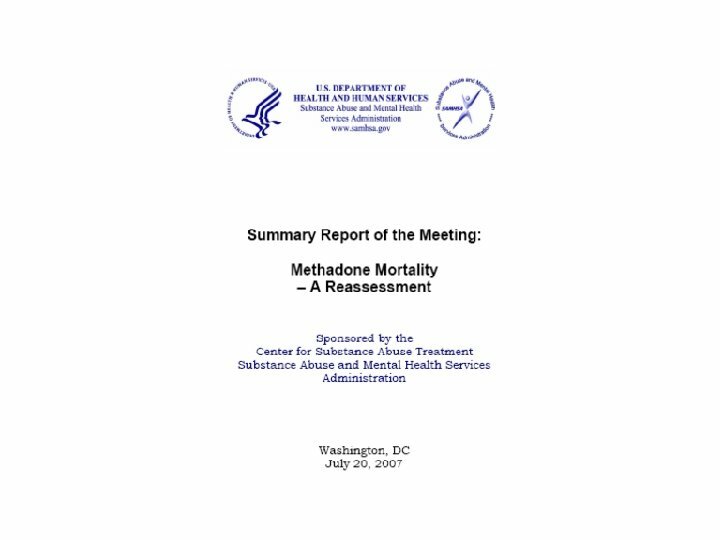 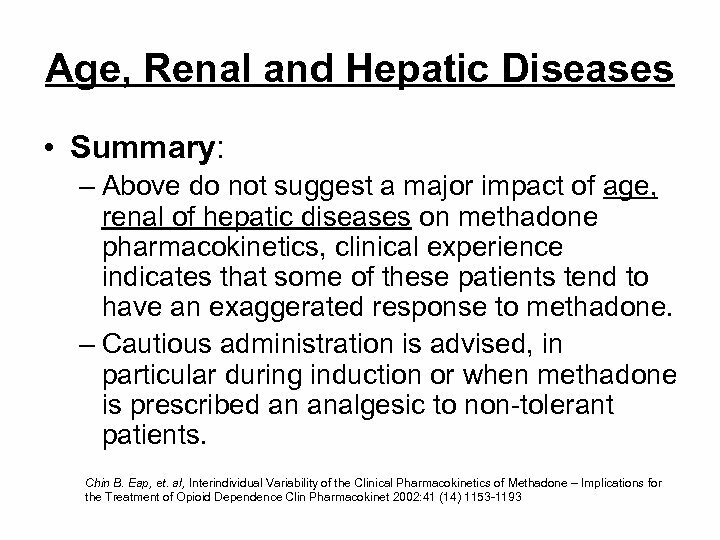 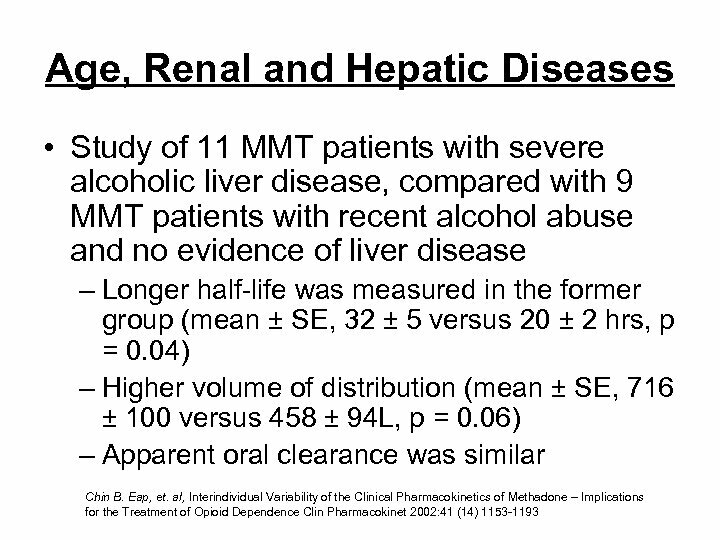 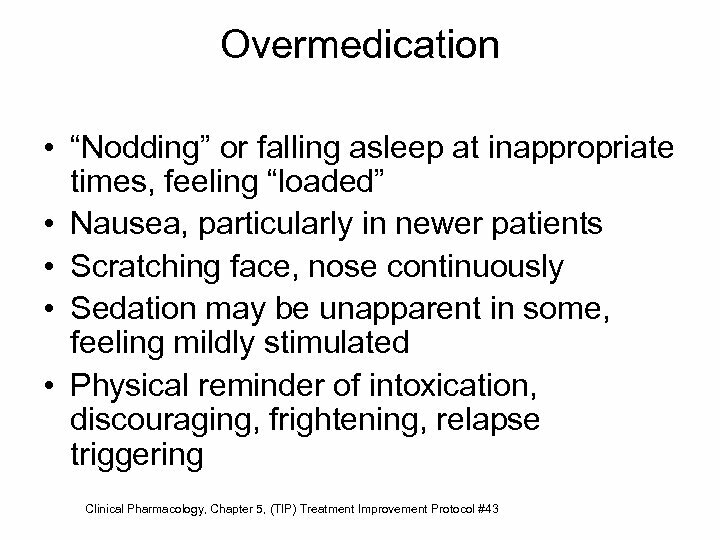 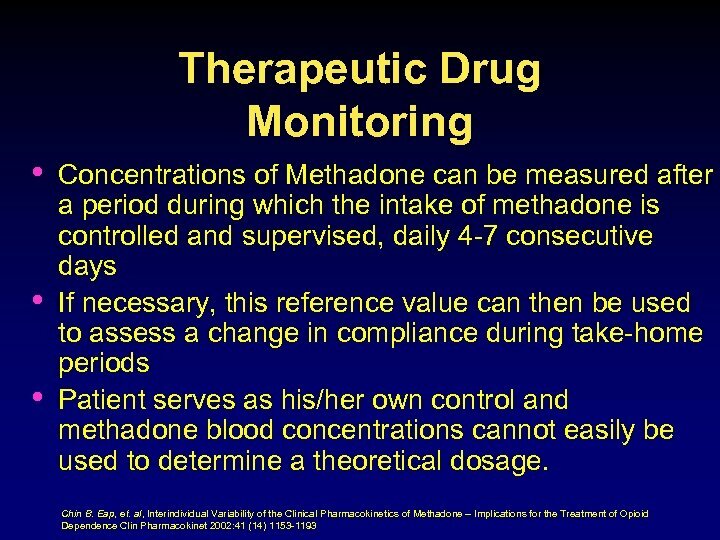 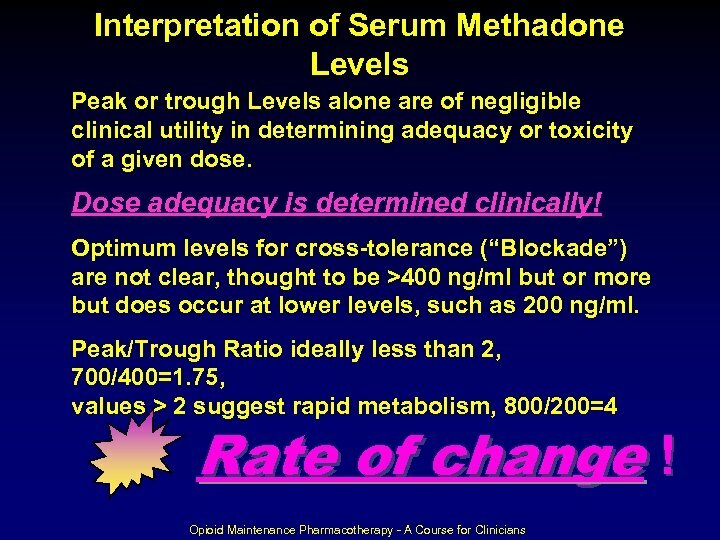 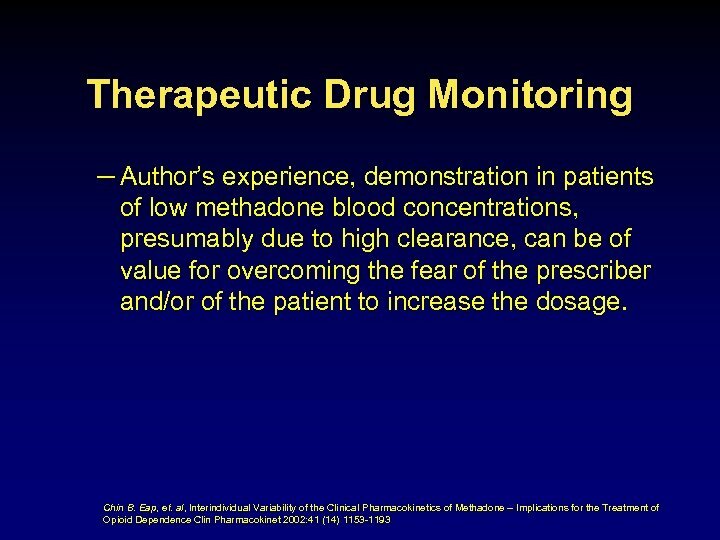 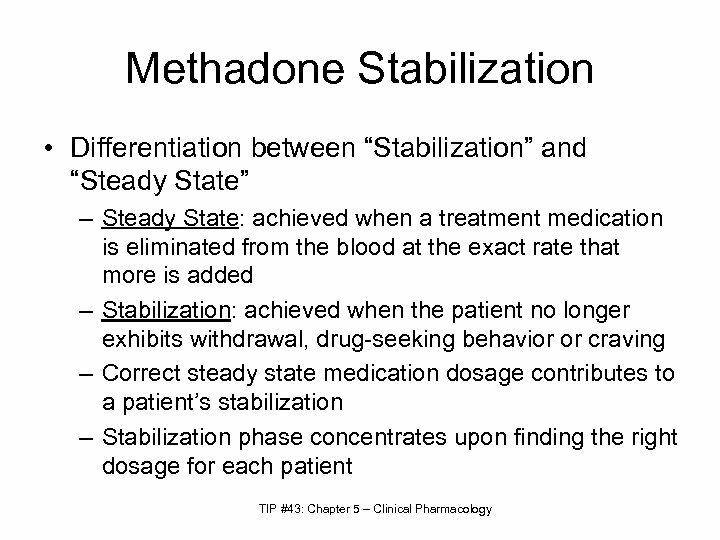 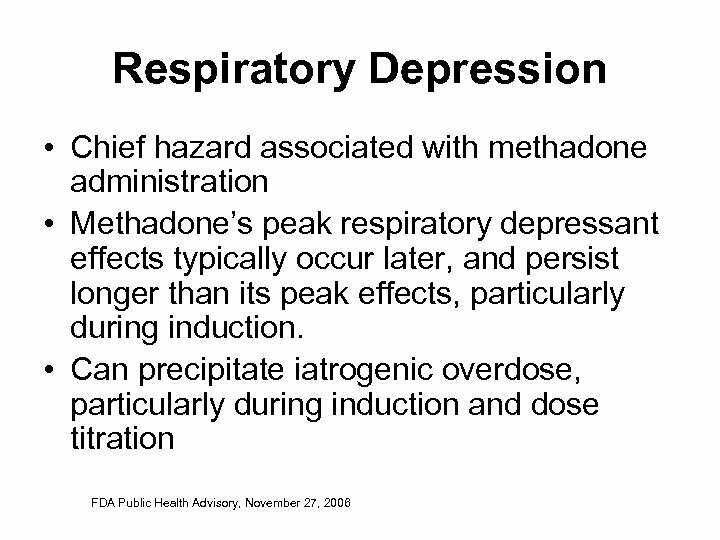 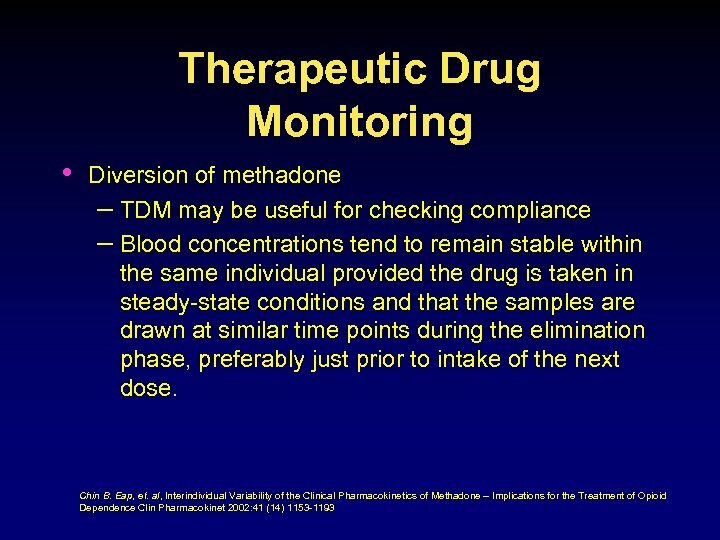 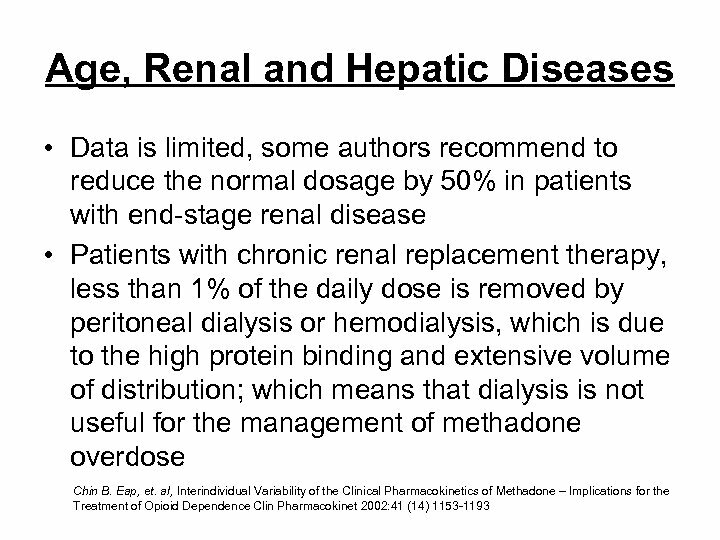 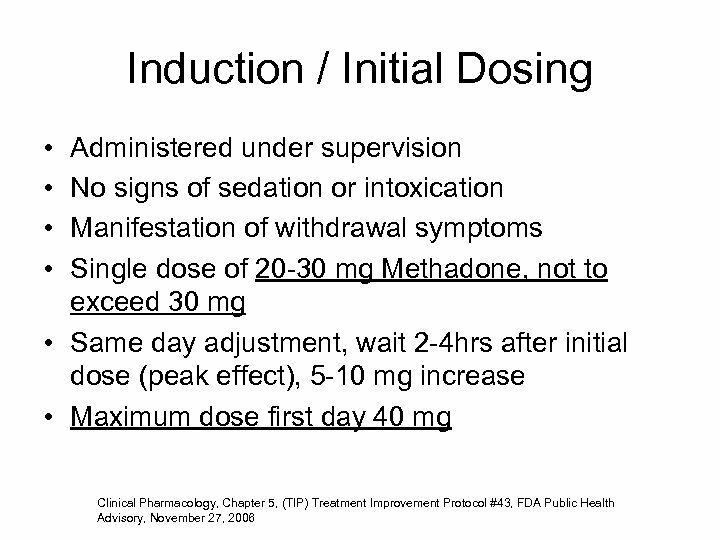 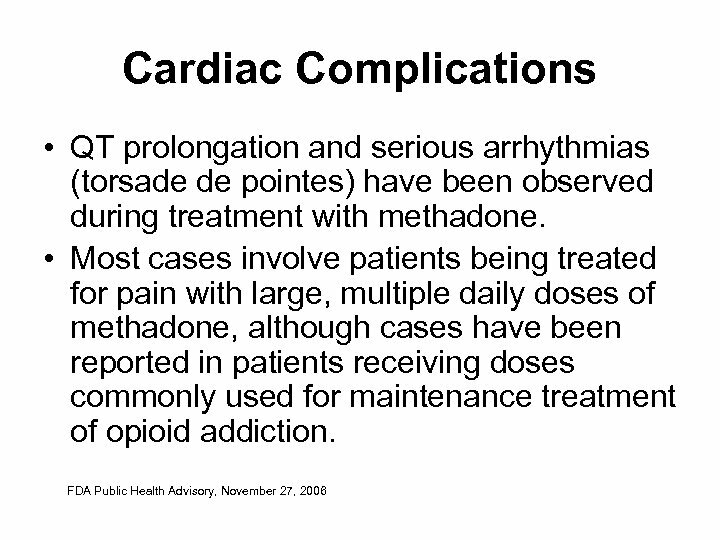 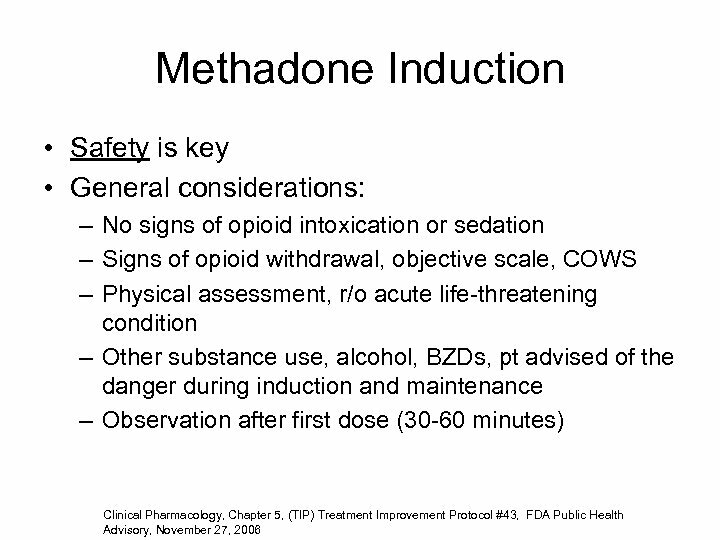 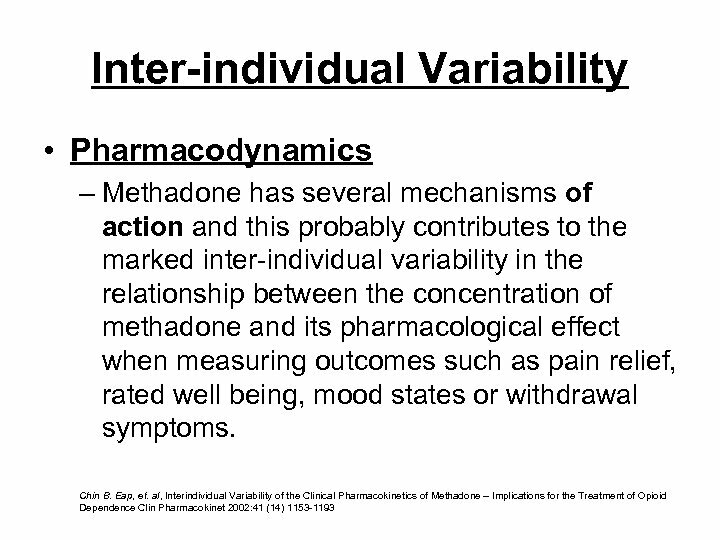 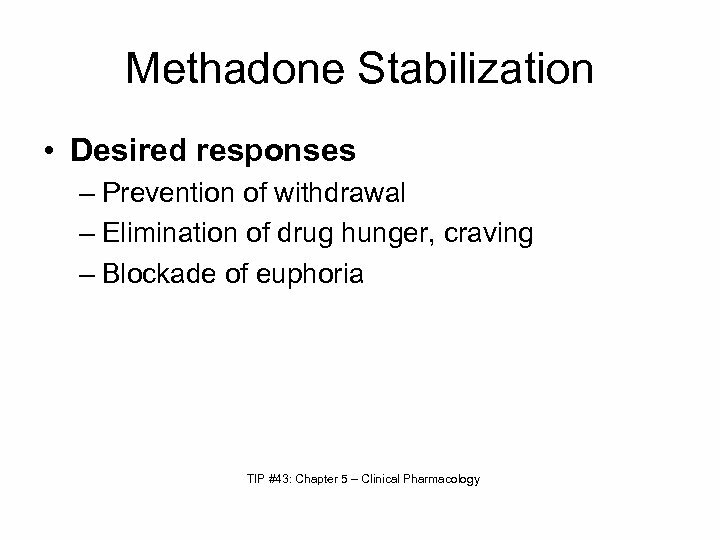 Hepatic Disease • Methadone has not been extensively evaluated in patients with hepatic insufficiency. 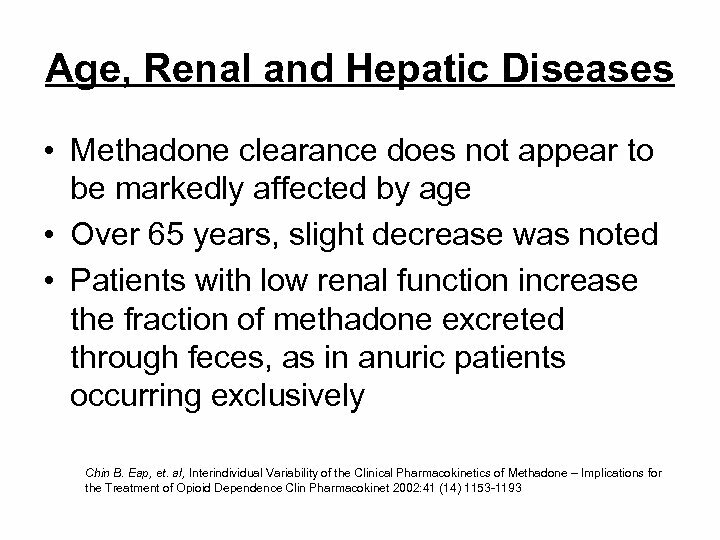 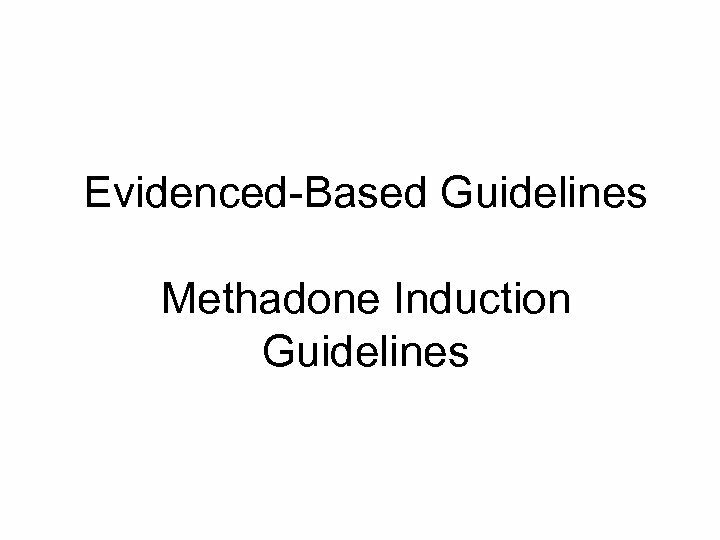 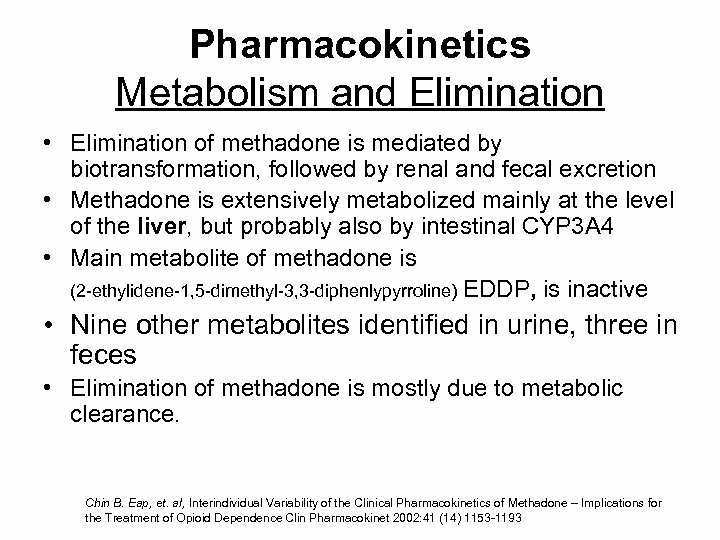 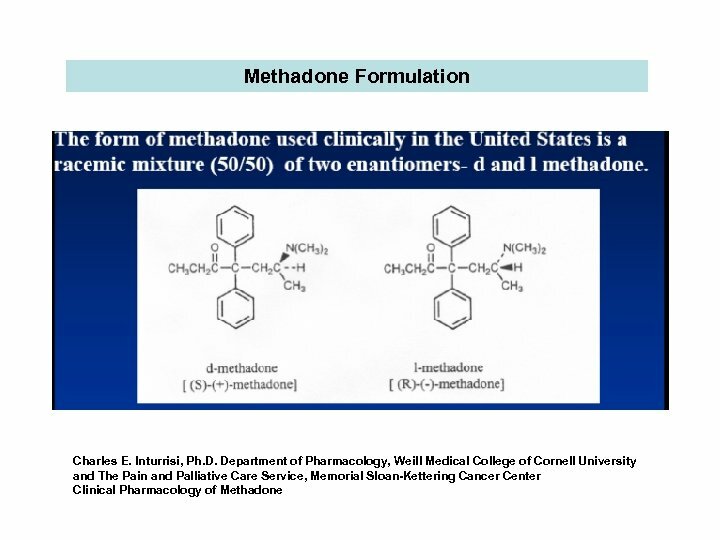 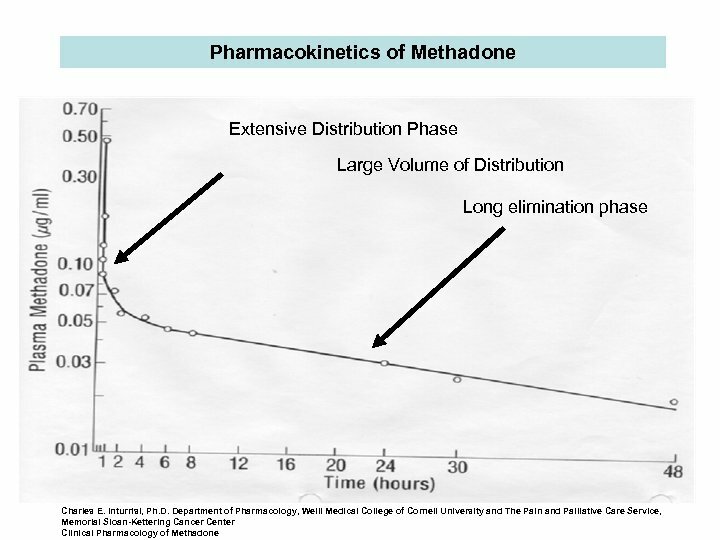 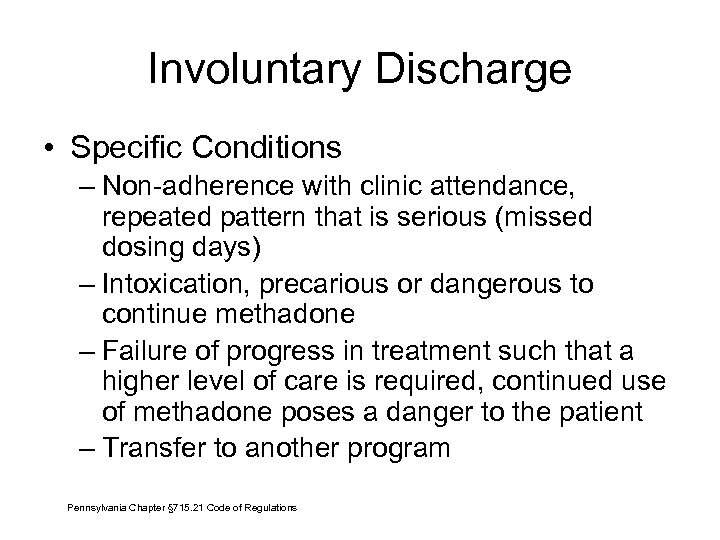 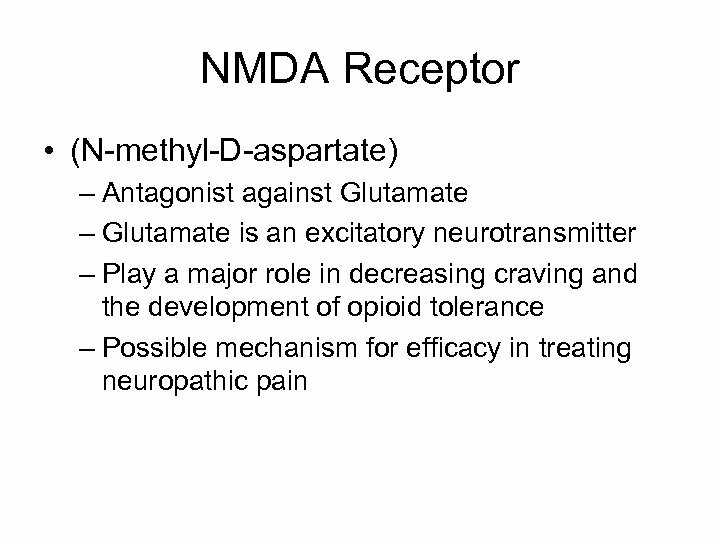 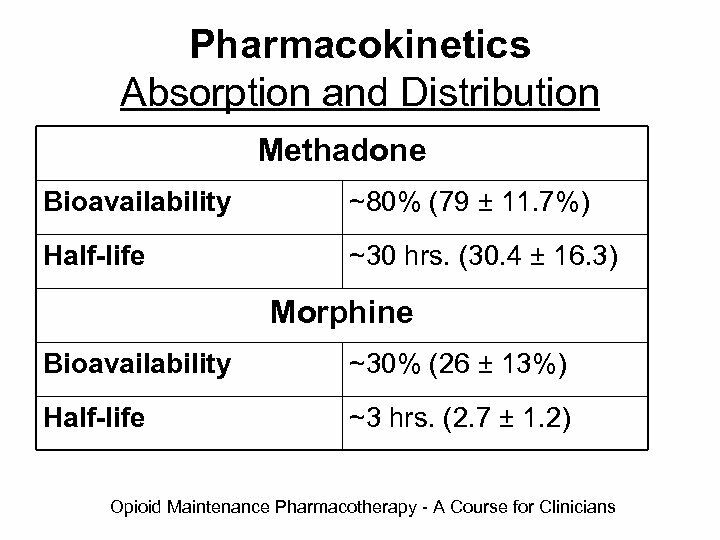 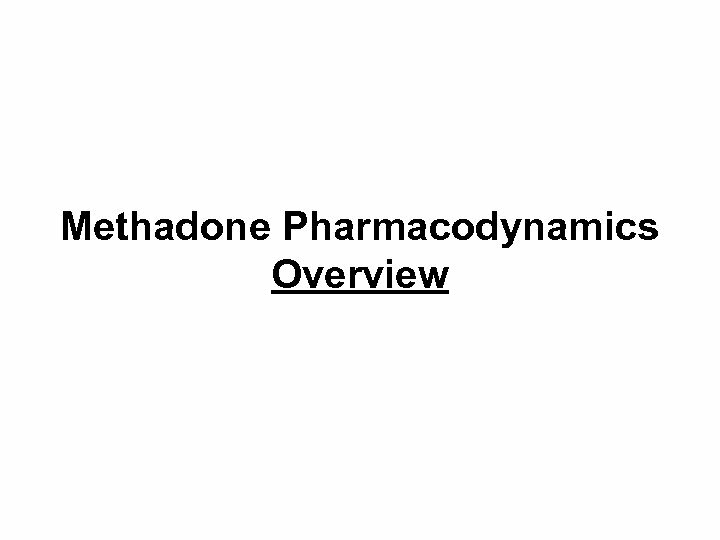 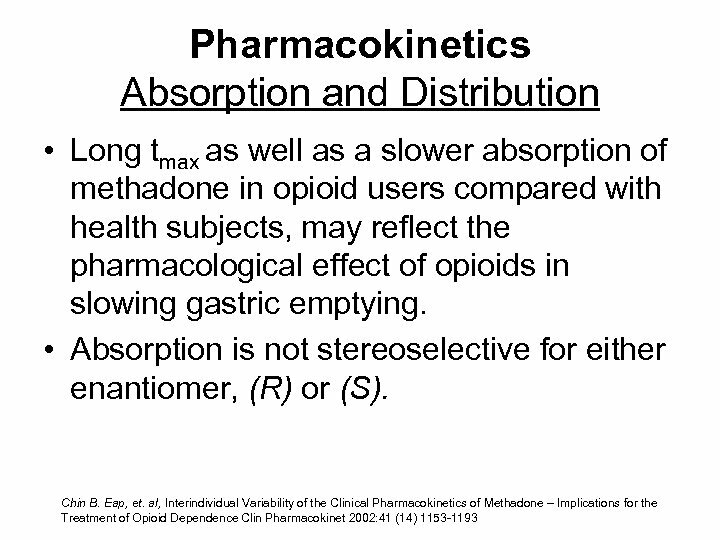 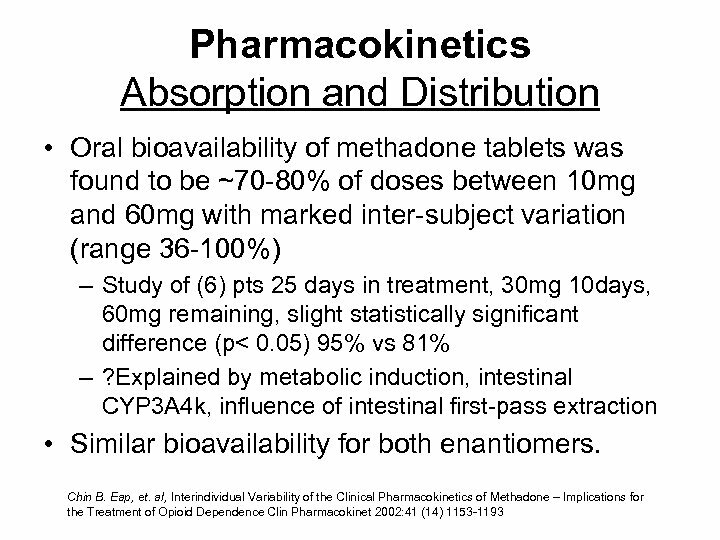 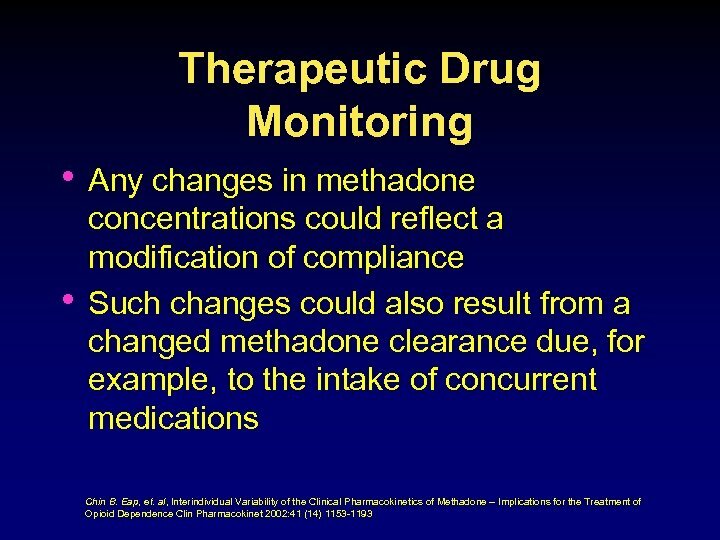 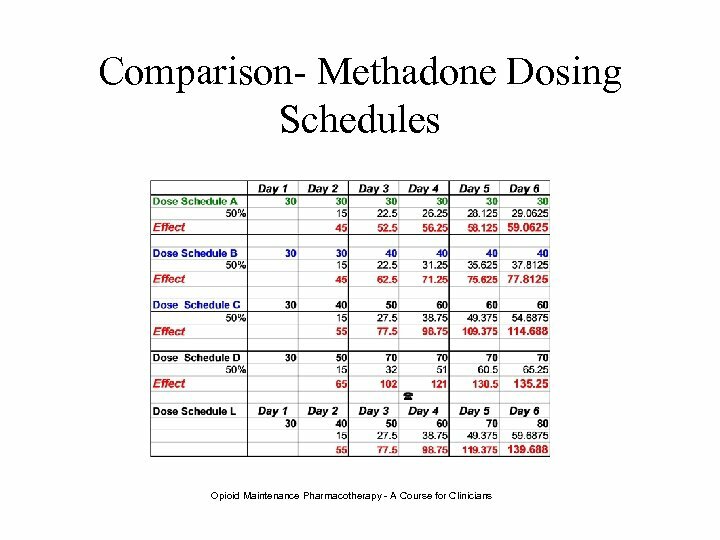 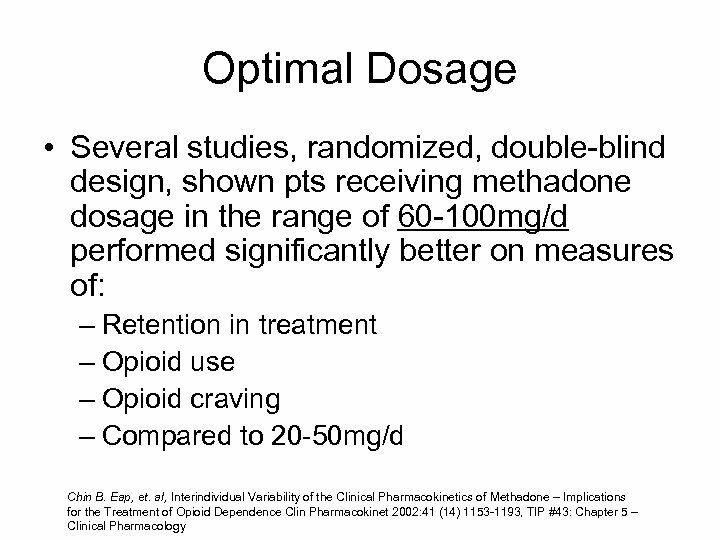 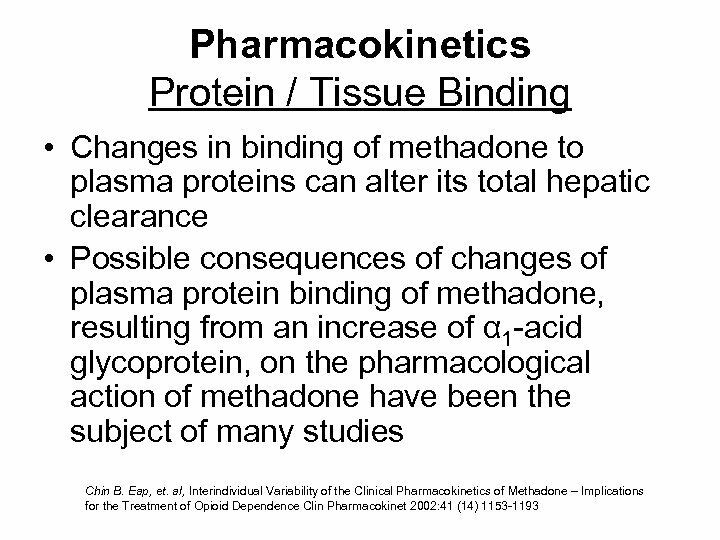 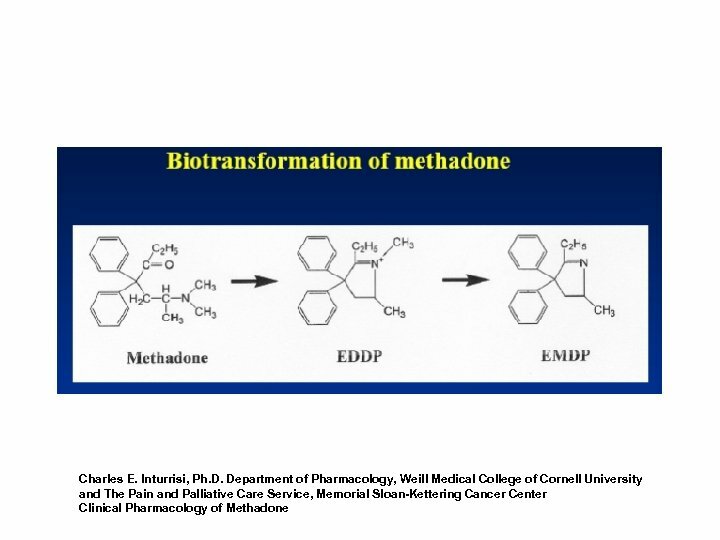 • Methadone is metabolized by hepatic pathways, therefore patients with liver impairment may be at risk of accumulating methadone after multiple dosing. 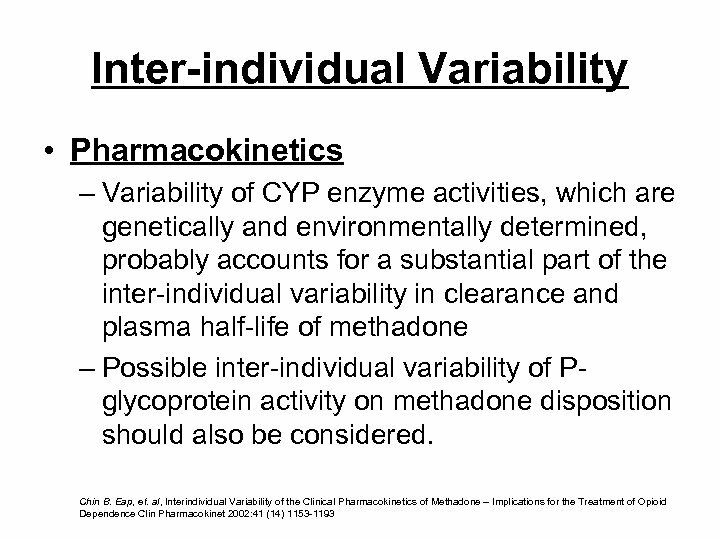 [Dolophine PI 2006]. 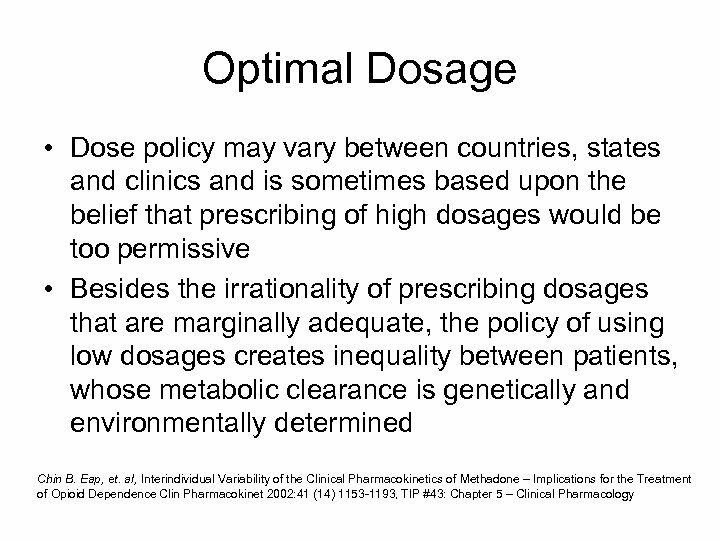 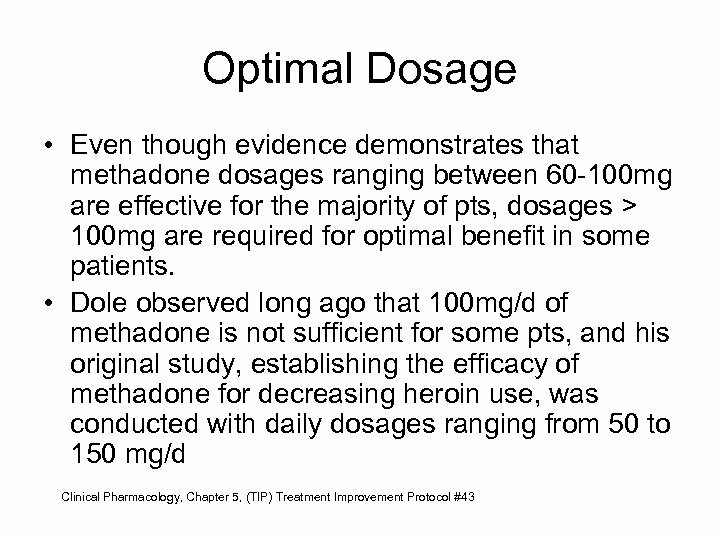 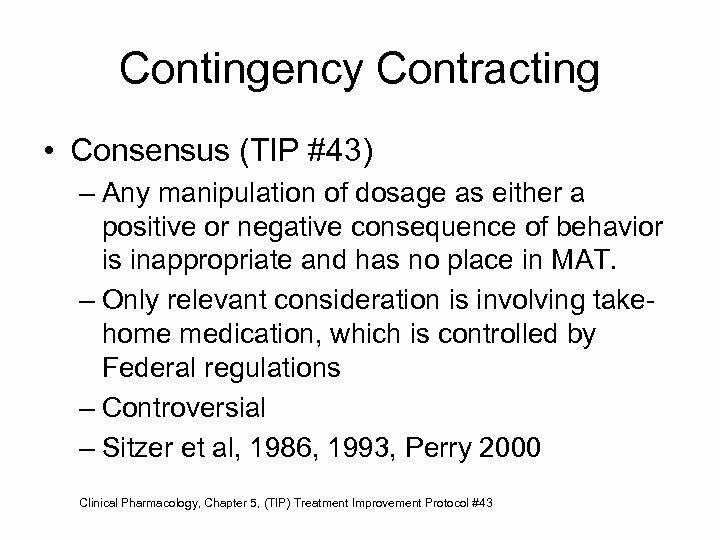 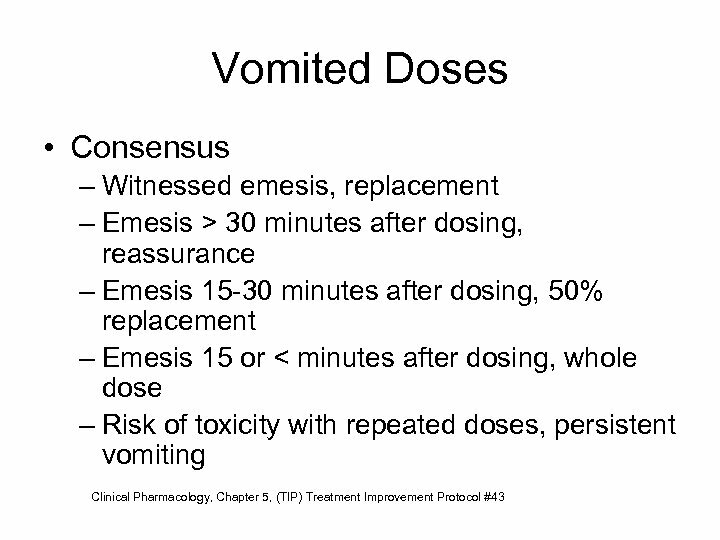 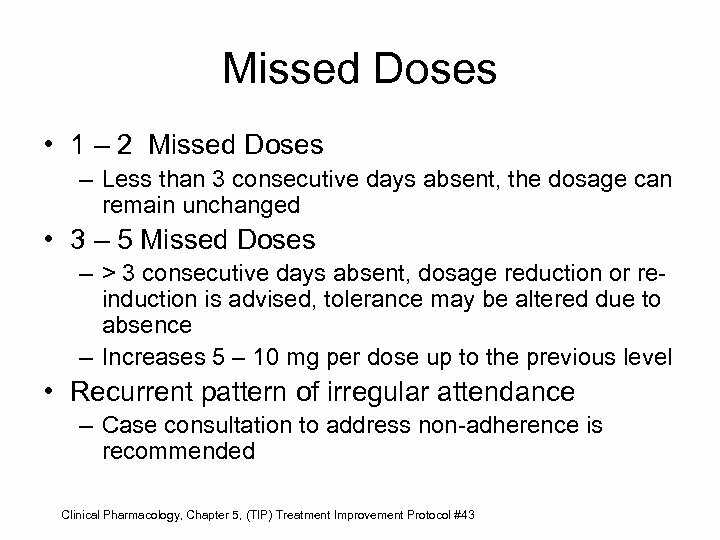 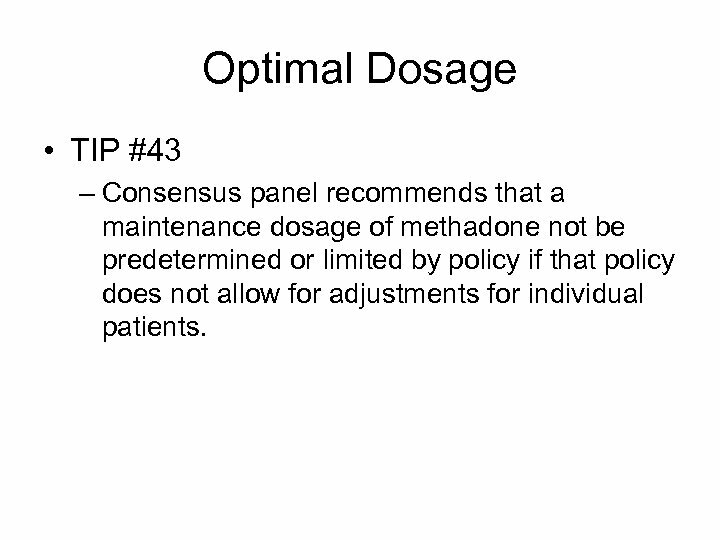 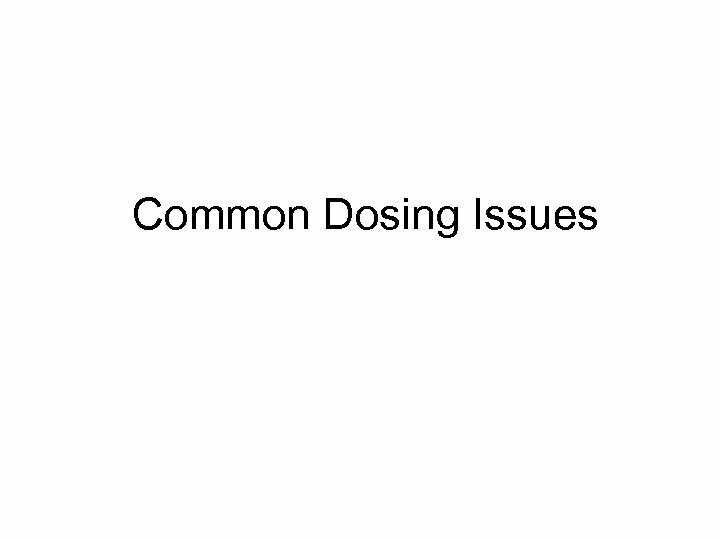 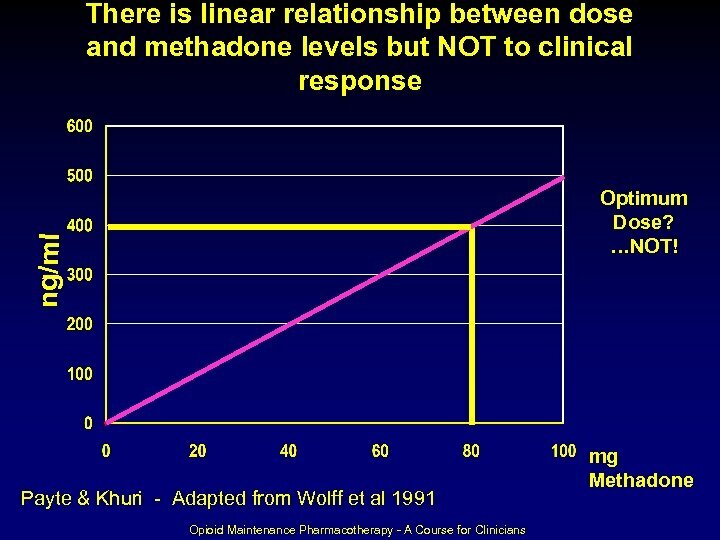 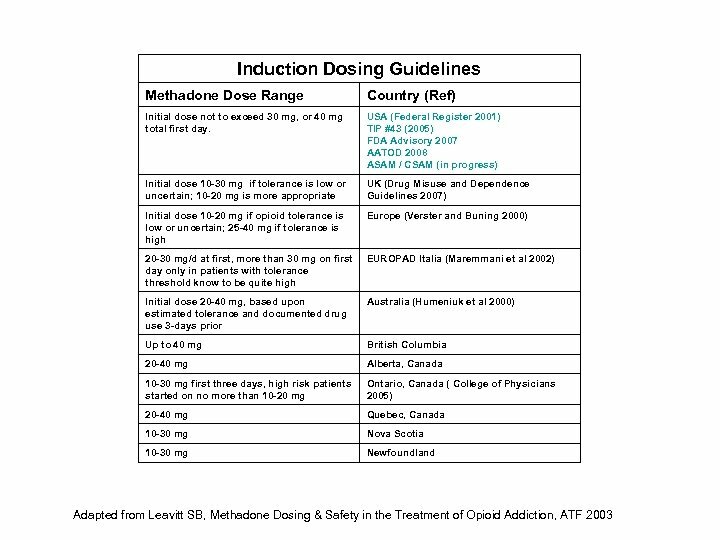 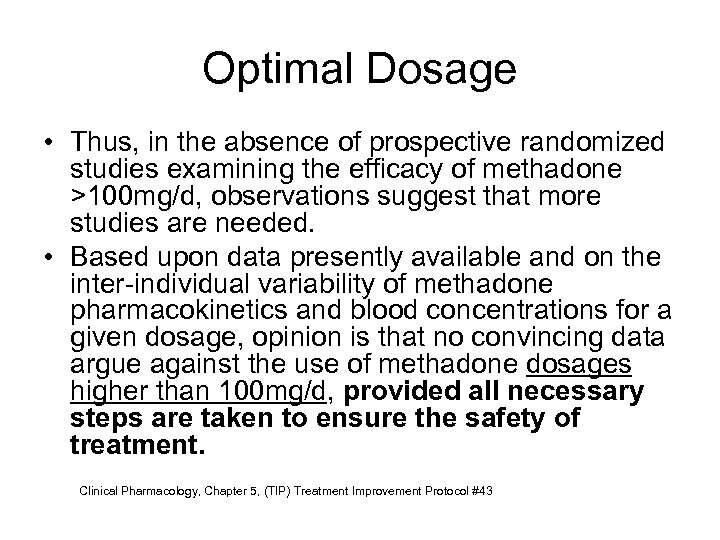 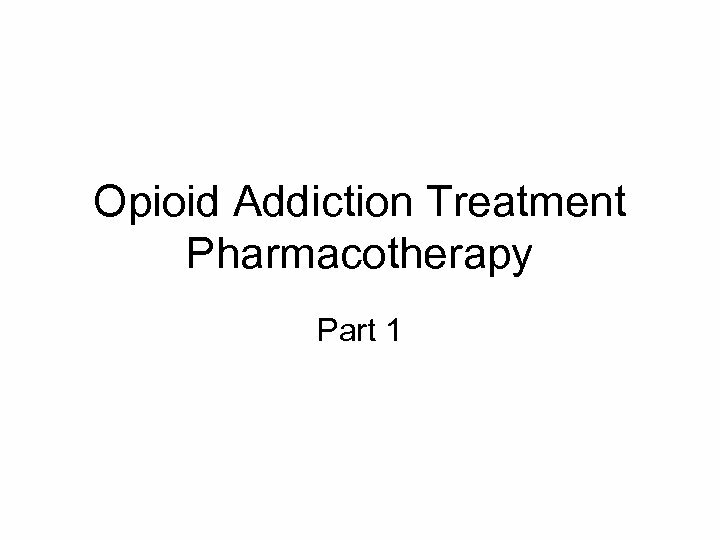 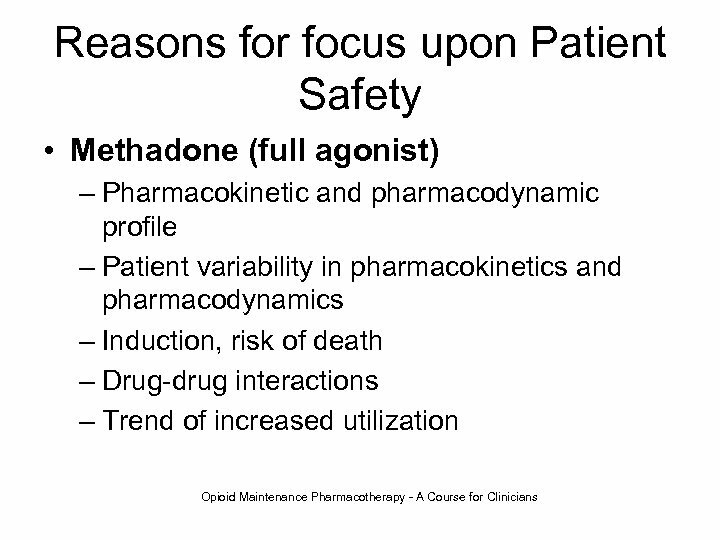 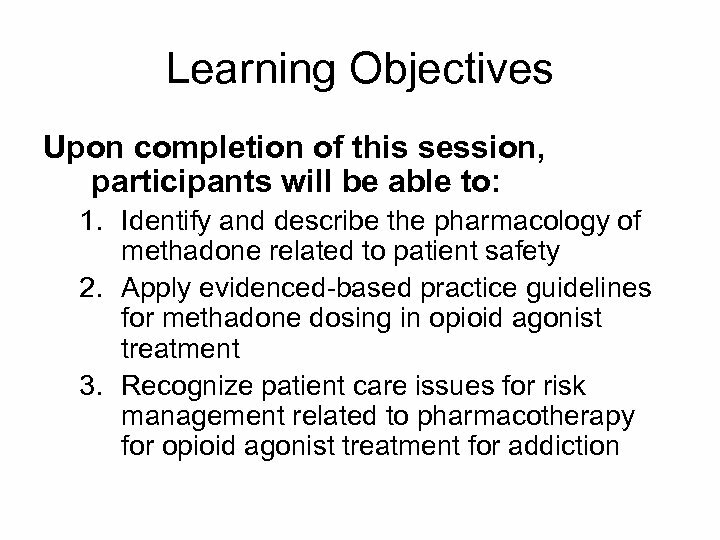 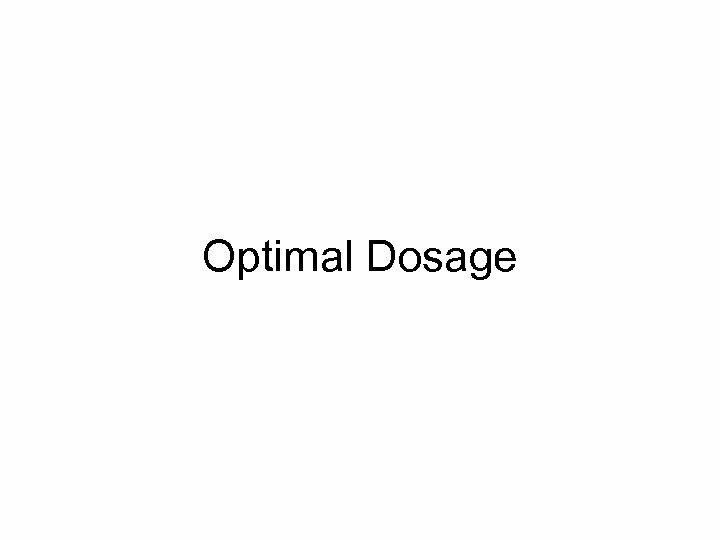 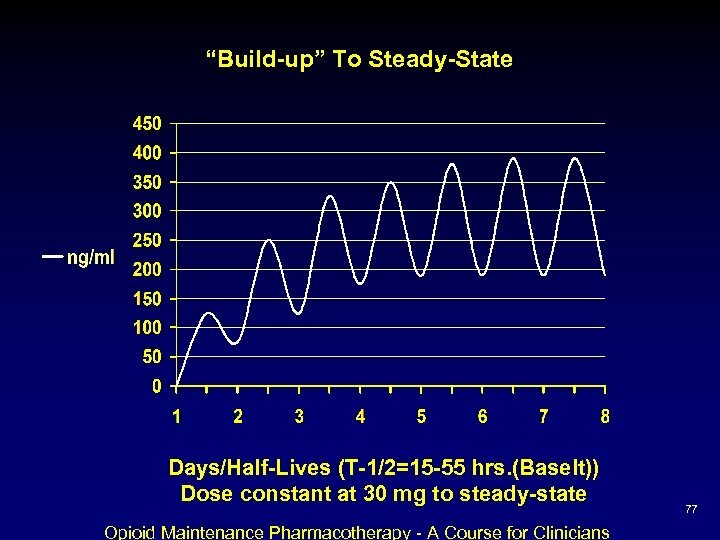 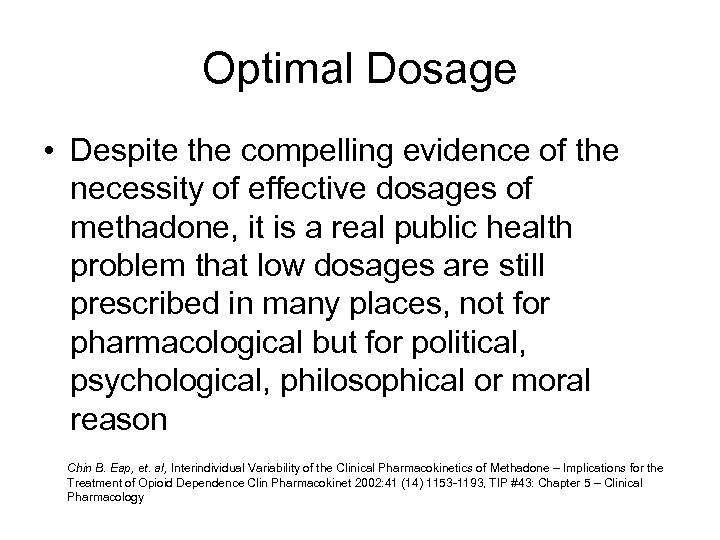 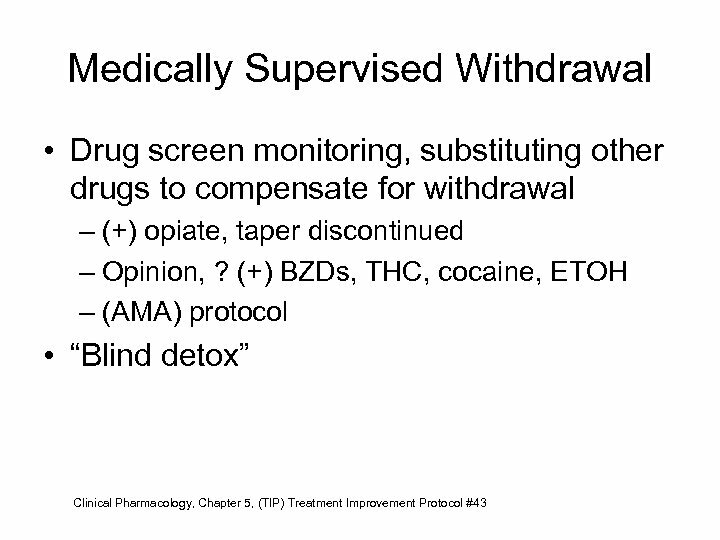 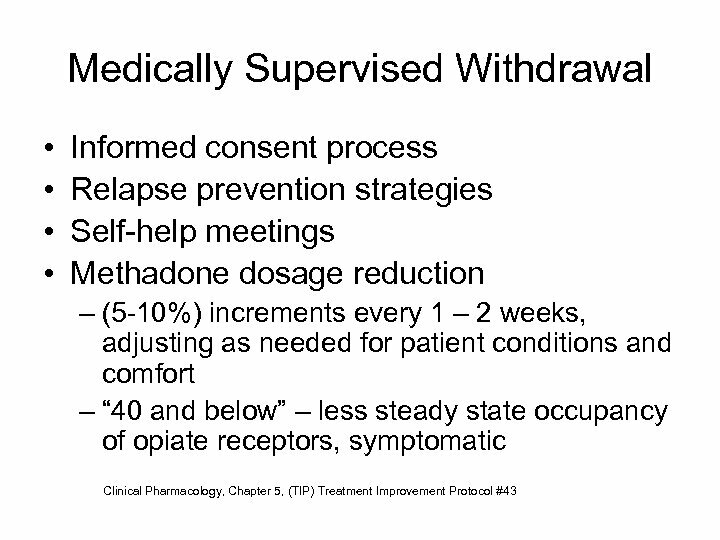 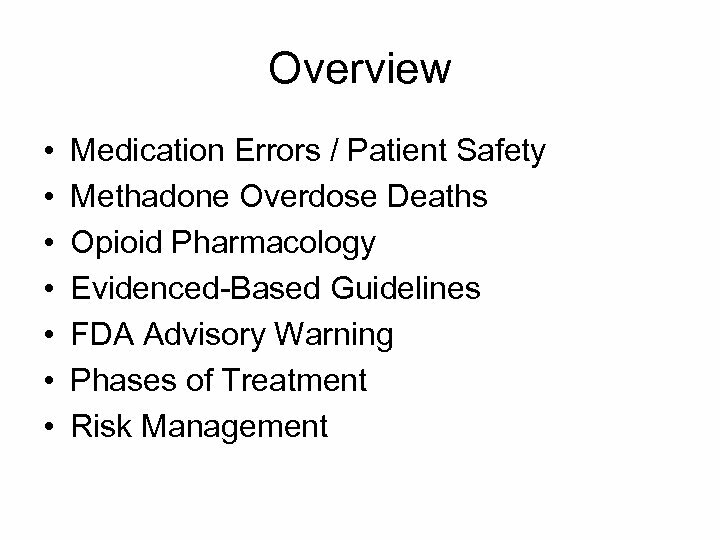 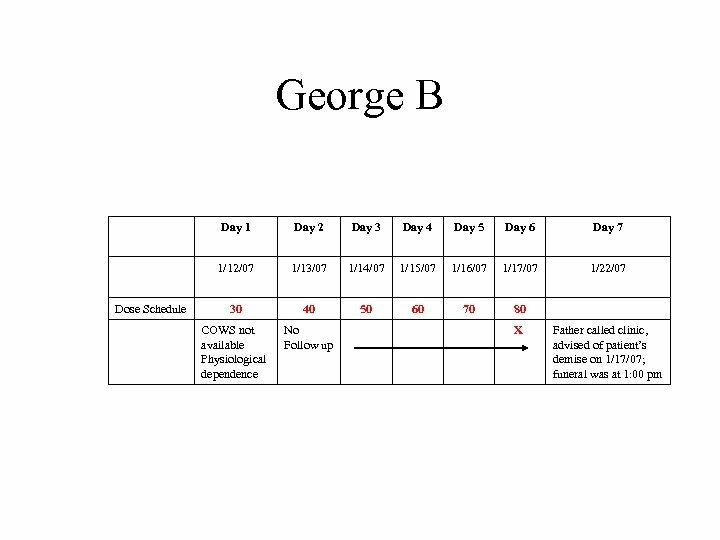 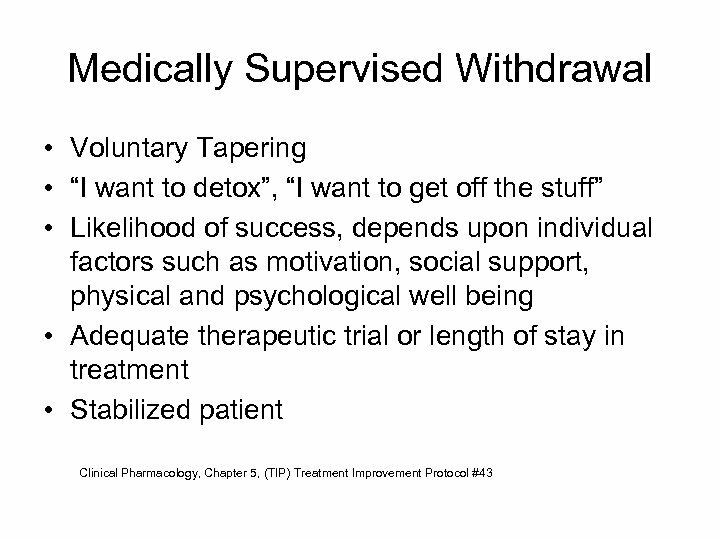 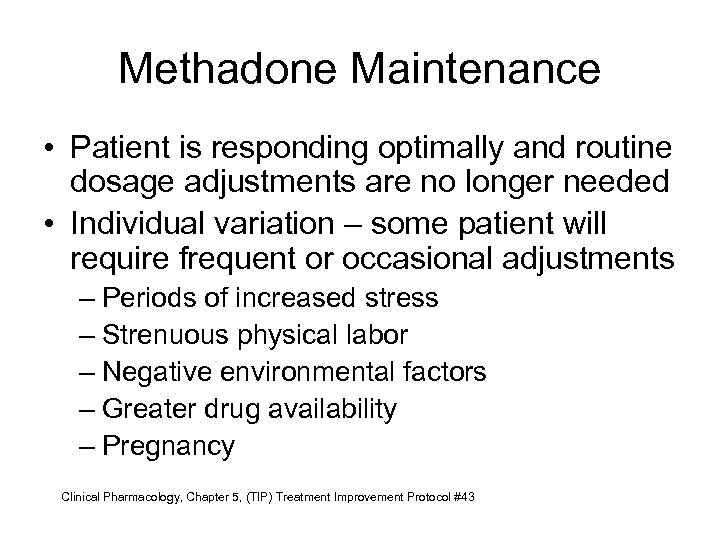 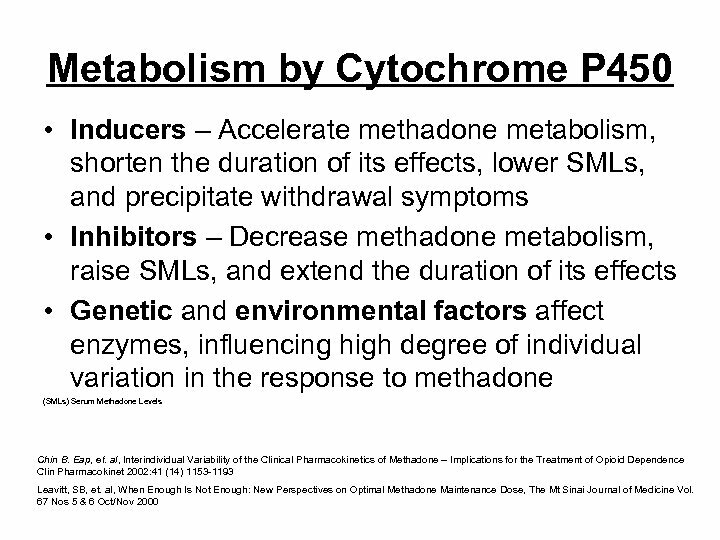 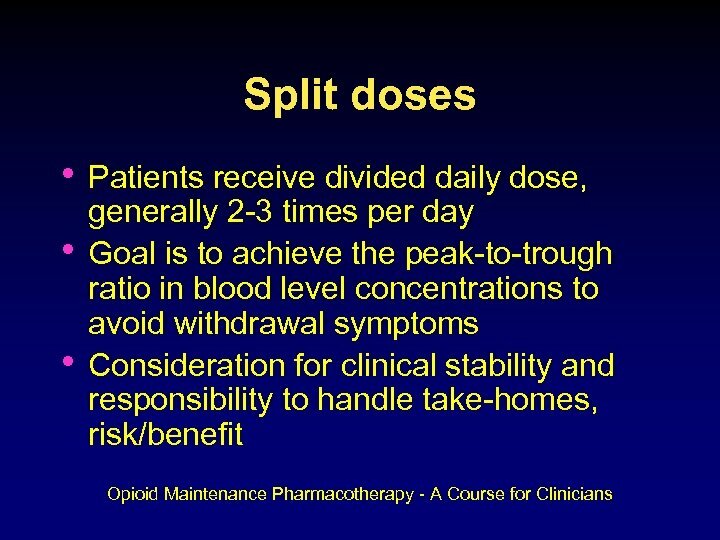 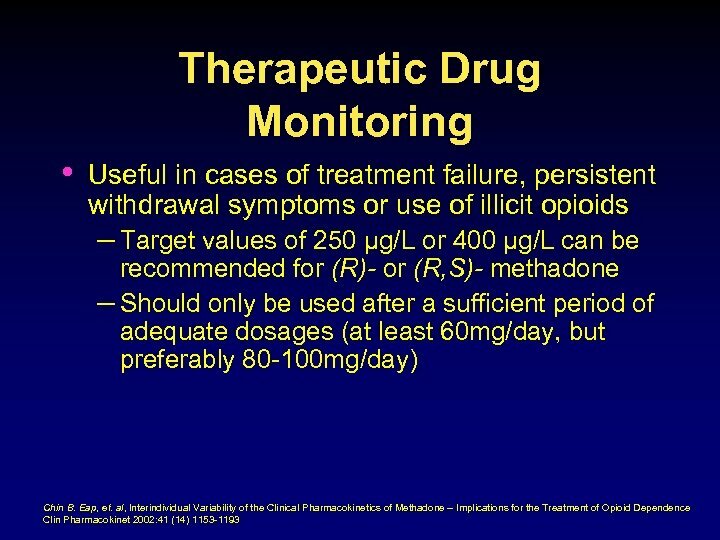 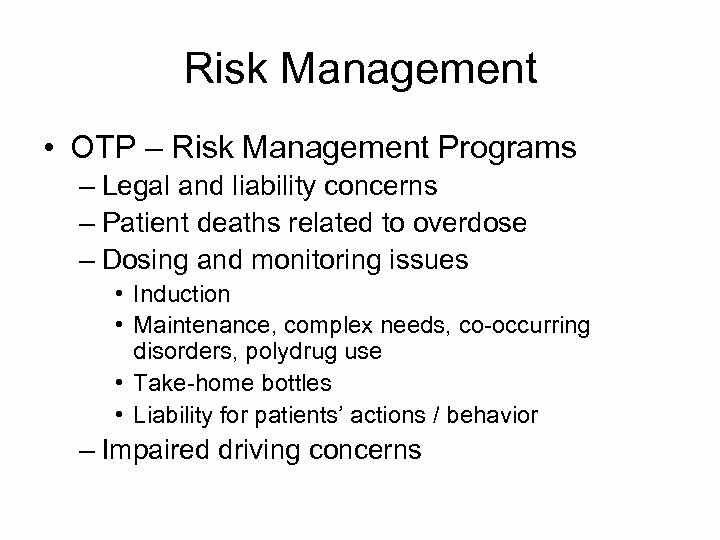 Optimal Dosage • TIP #43 – Consensus panel recommends that a maintenance dosage of methadone not be predetermined or limited by policy if that policy does not allow for adjustments for individual patients. 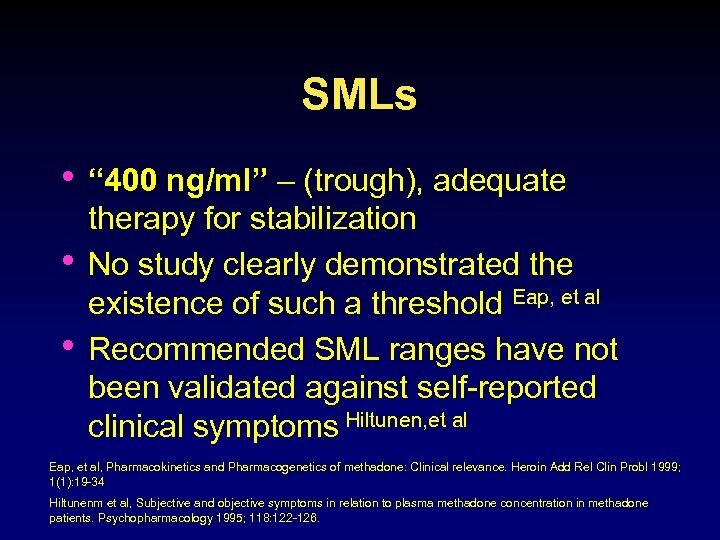 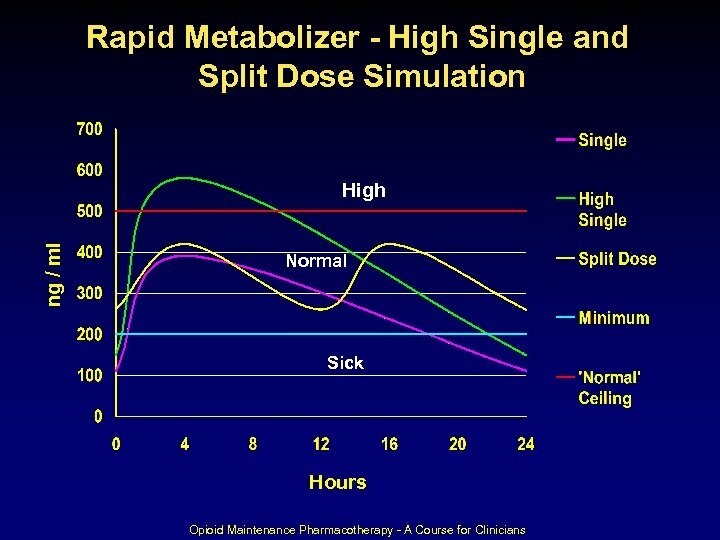 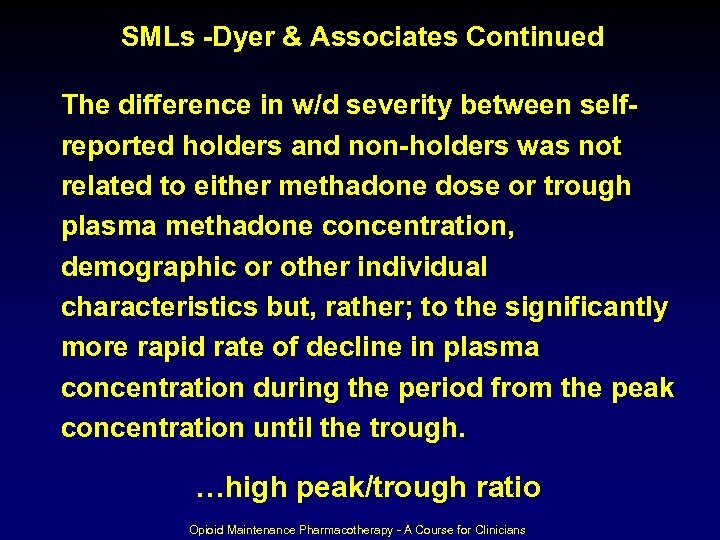 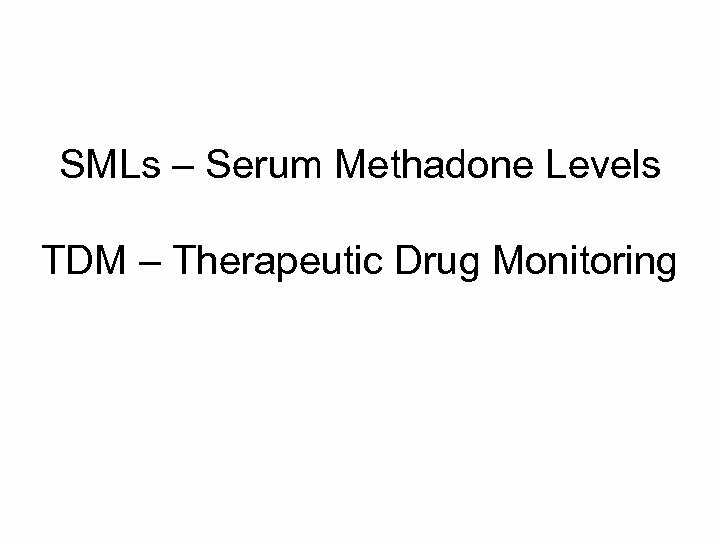 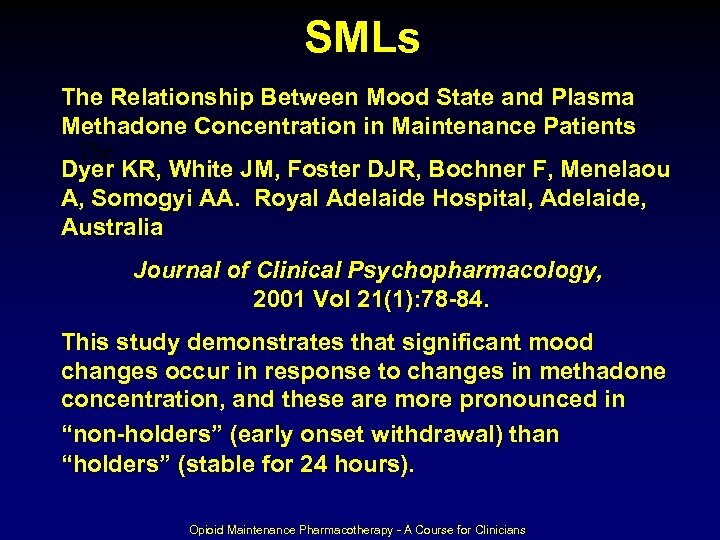 SMLs • “ 400 ng/ml” – (trough), adequate • • therapy for stabilization No study clearly demonstrated the existence of such a threshold Eap, et al Recommended SML ranges have not been validated against self-reported clinical symptoms Hiltunen, et al Eap, et al, Pharmacokinetics and Pharmacogenetics of methadone: Clinical relevance. 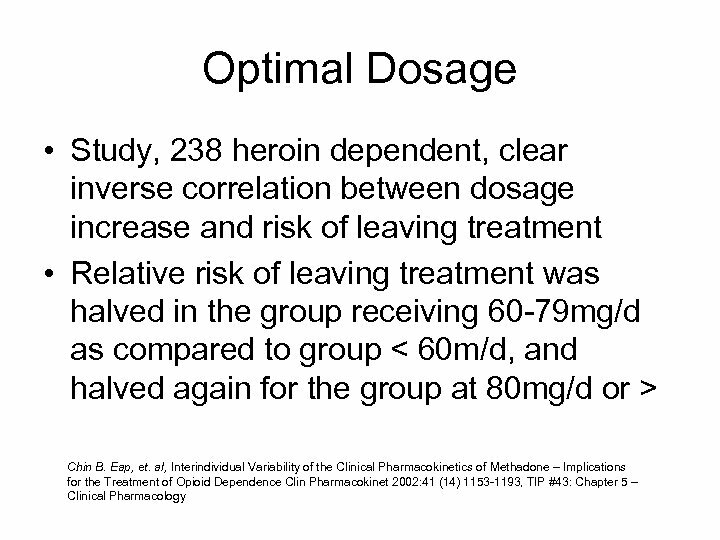 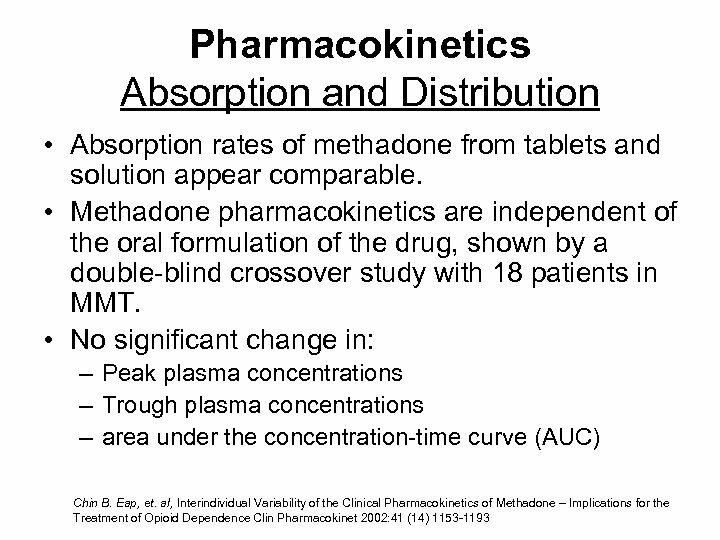 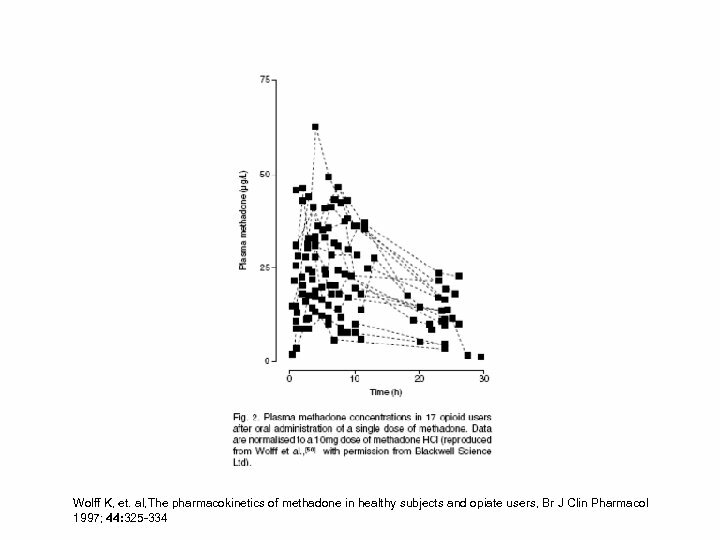 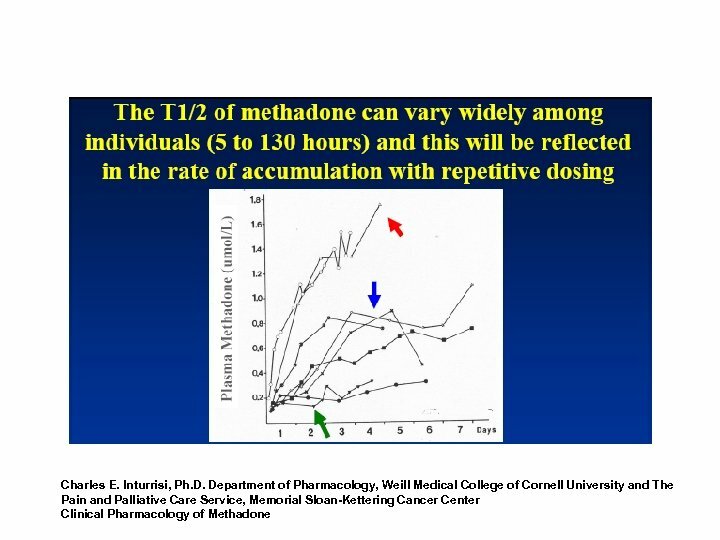 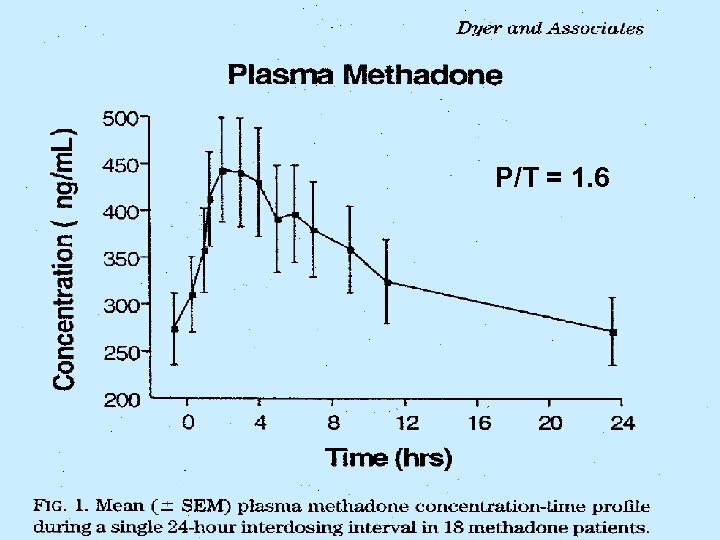 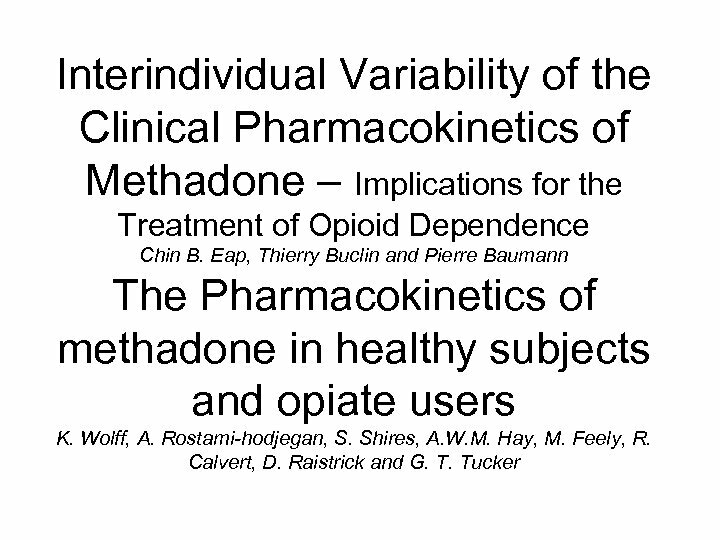 Heroin Add Rel Clin Probl 1999; 1(1): 19 -34 Hiltunenm et al, Subjective and objective symptoms in relation to plasma methadone concentration in methadone patients. 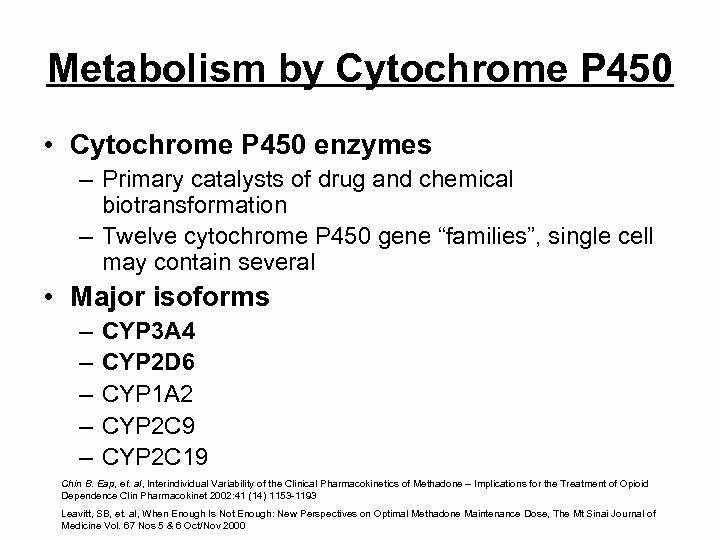 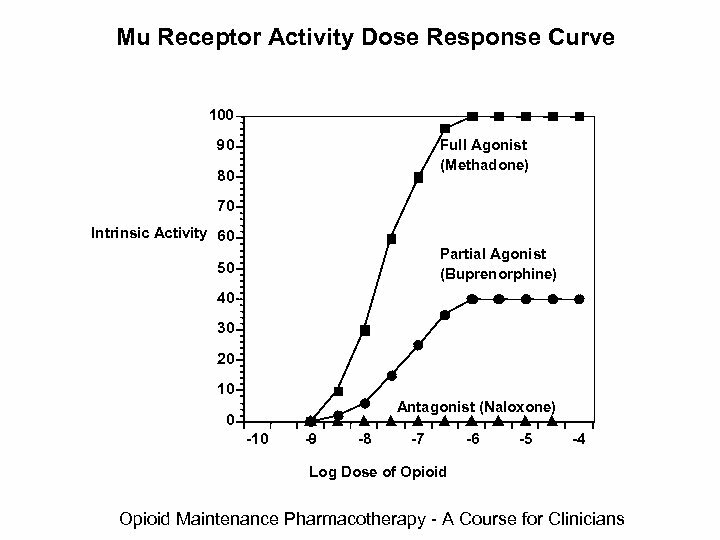 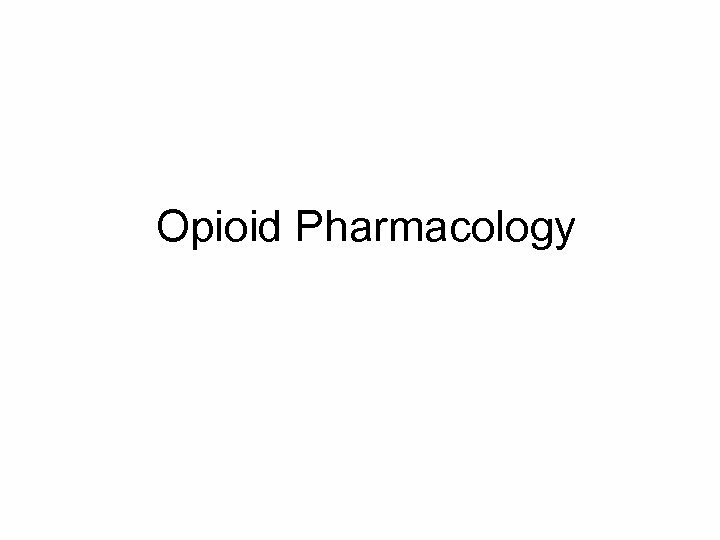 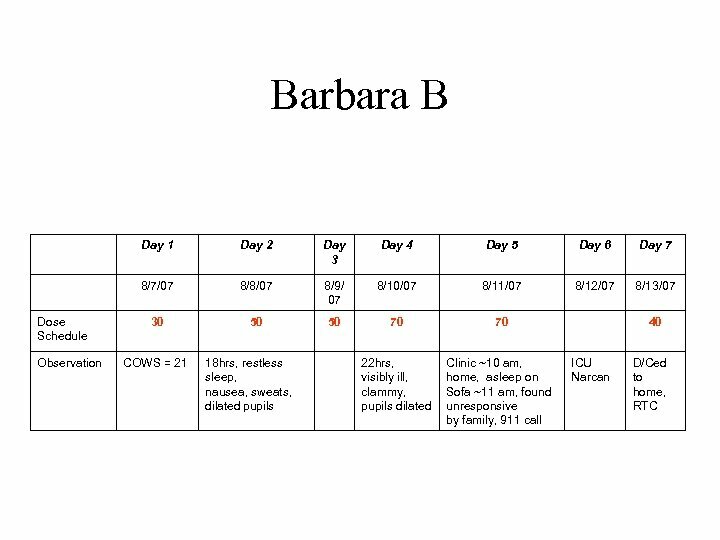 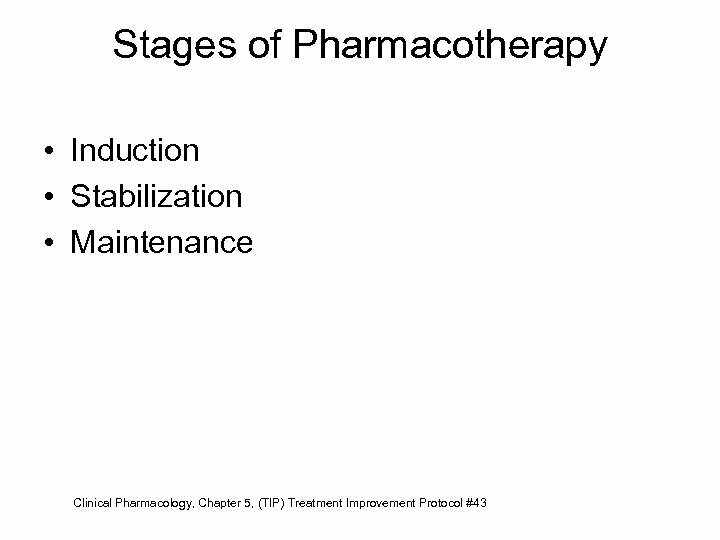 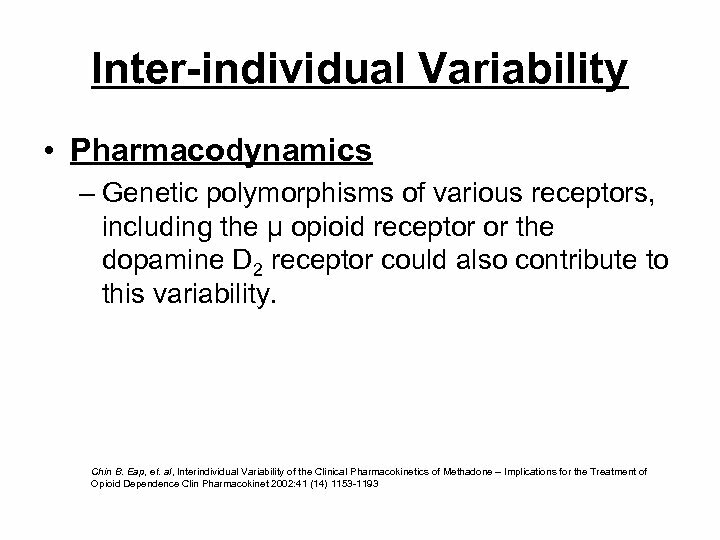 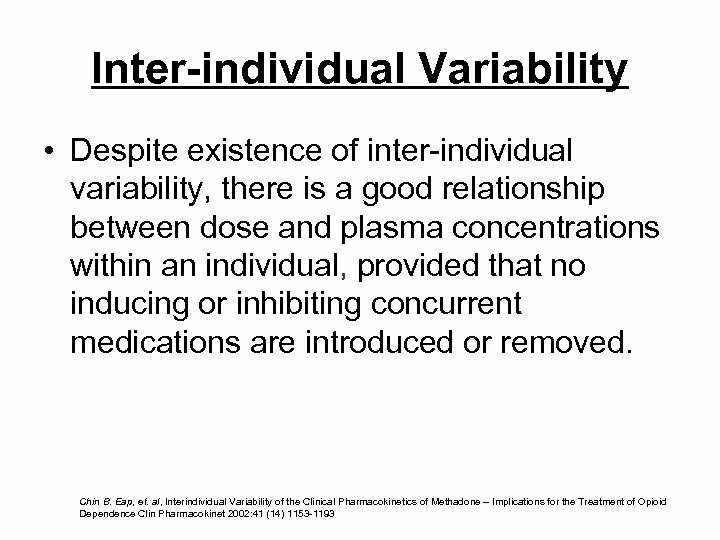 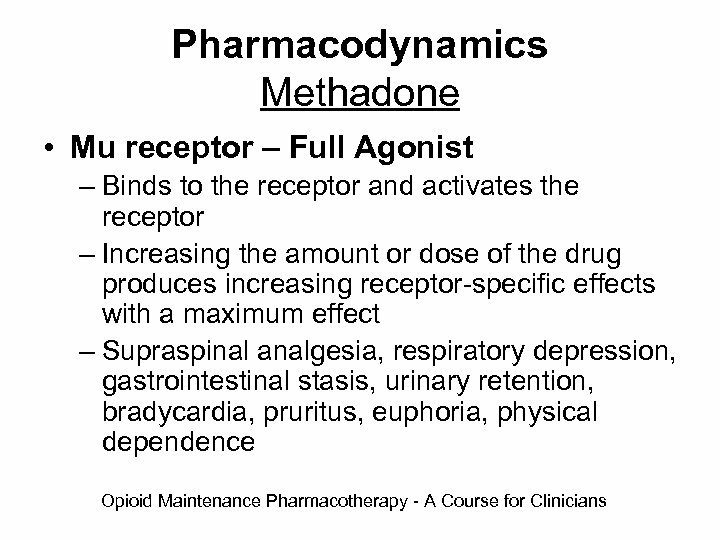 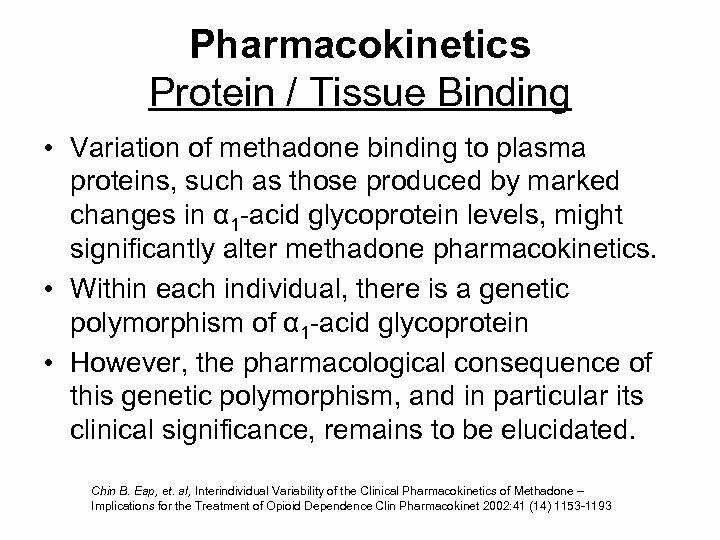 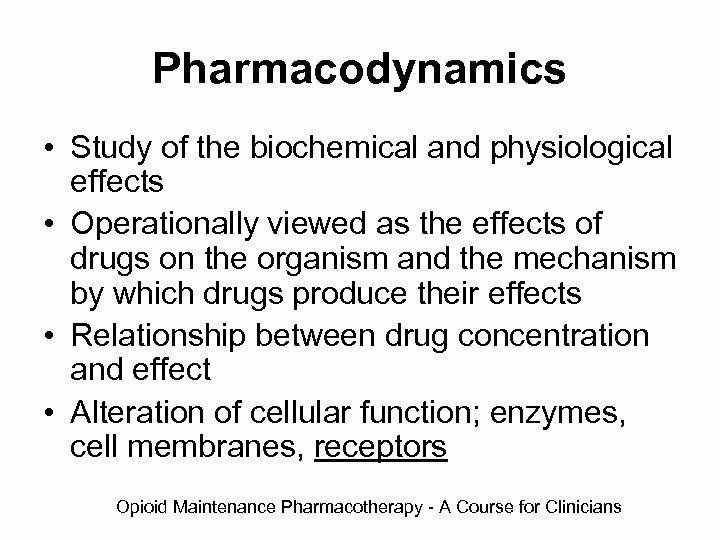 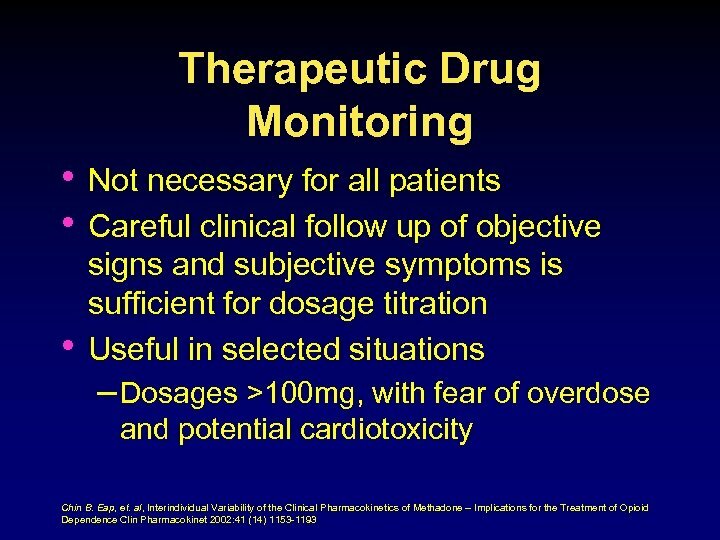 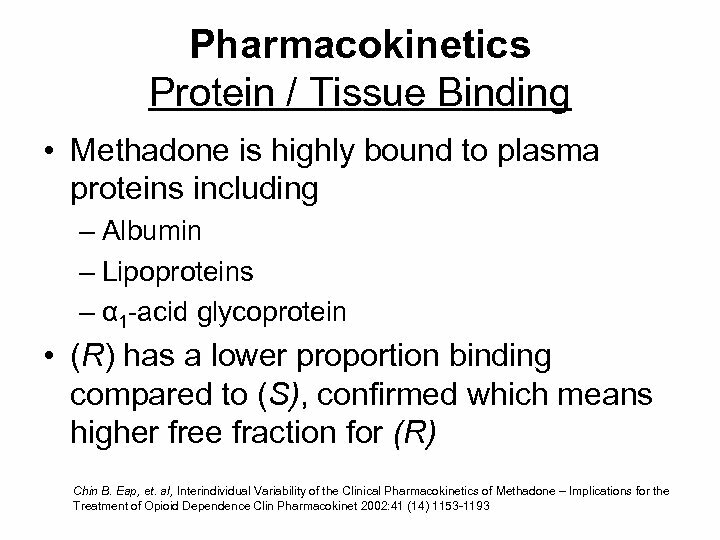 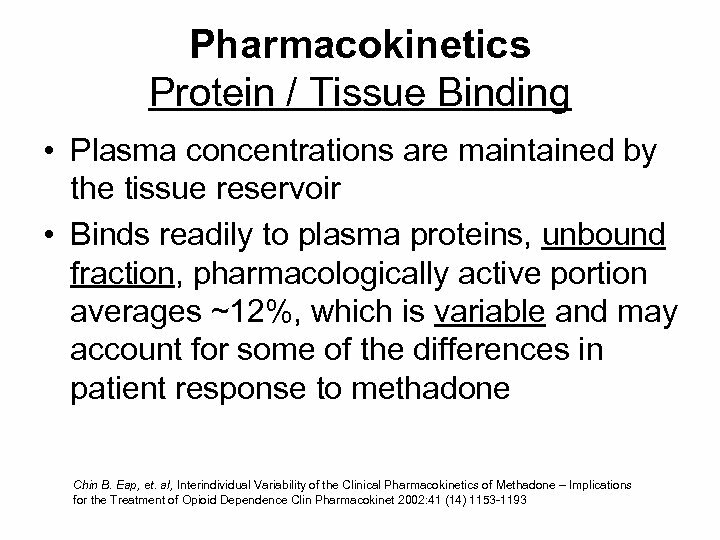 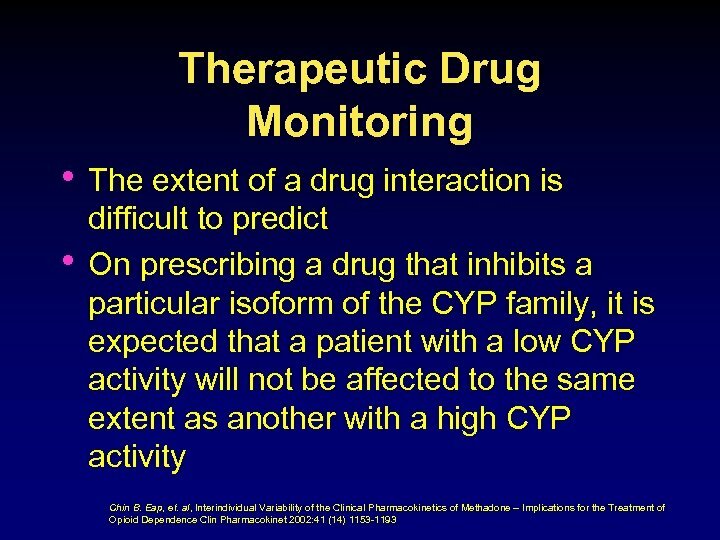 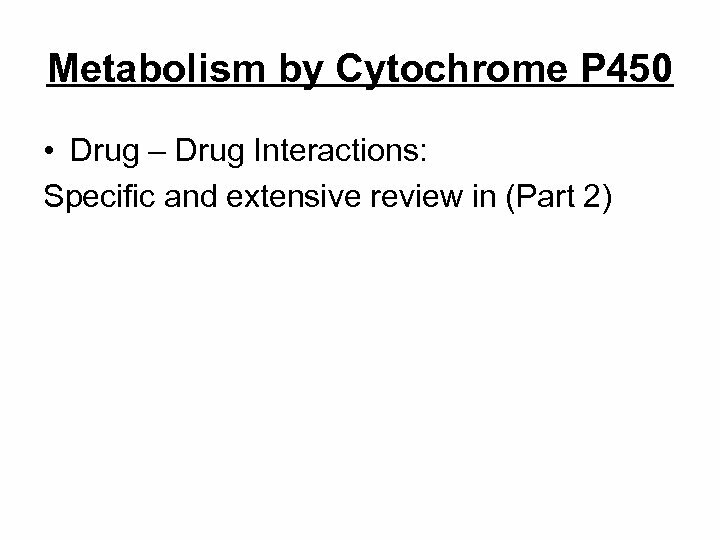 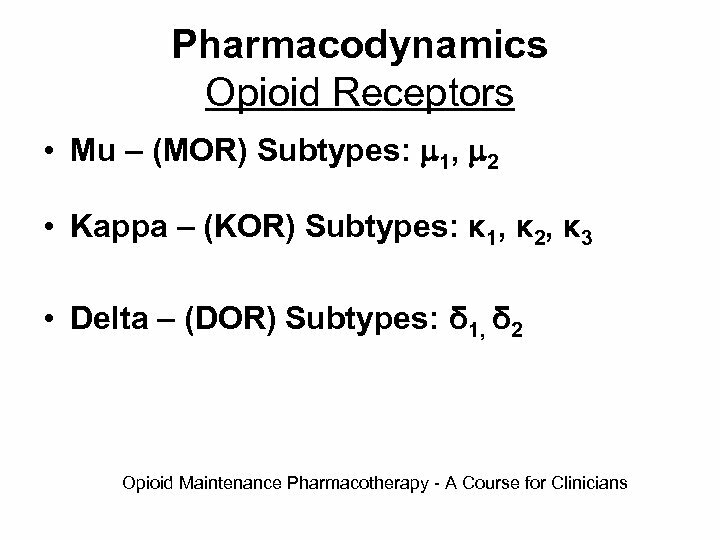 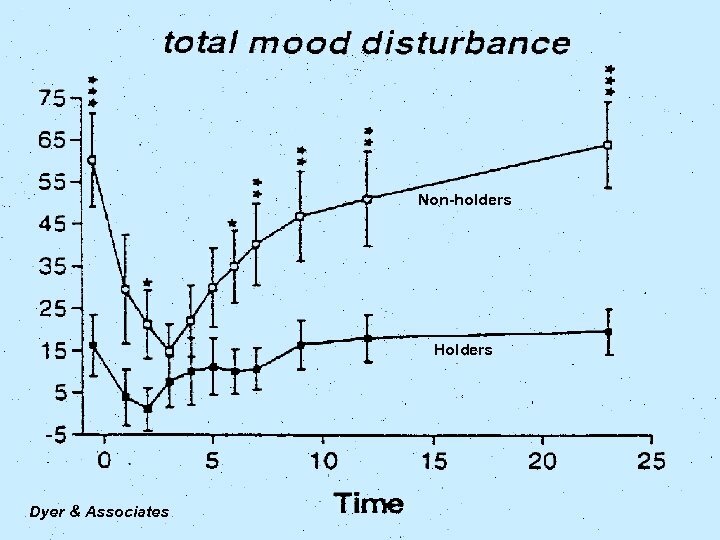 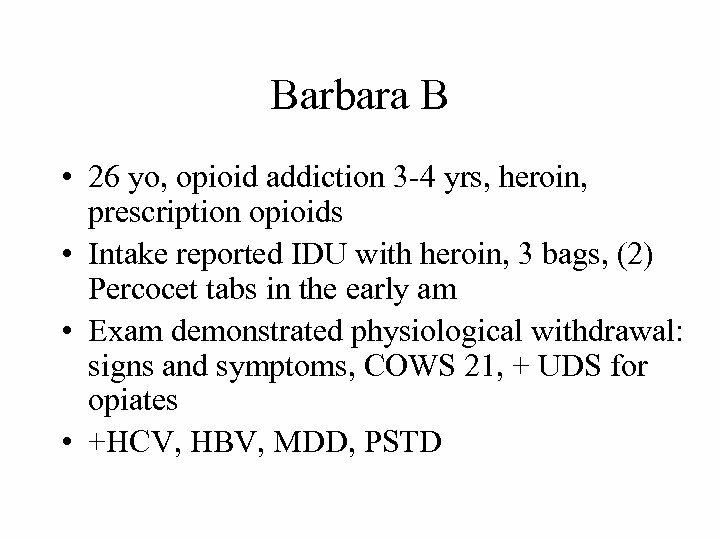 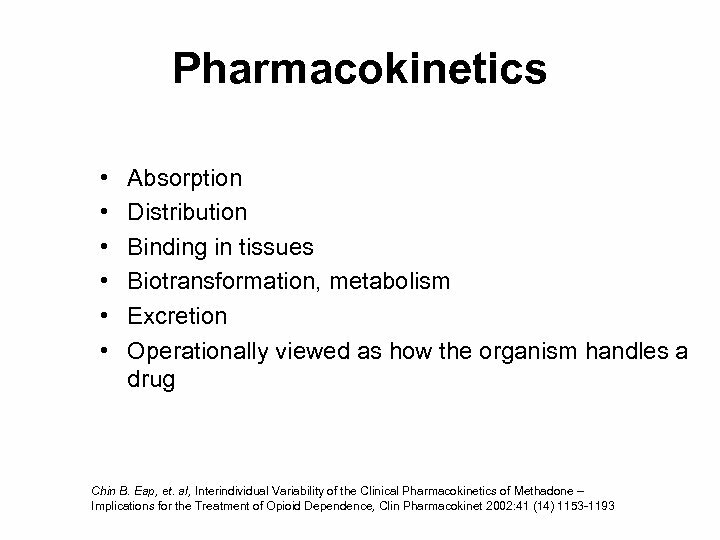 Psychopharmacology 1995; 118: 122 -126. 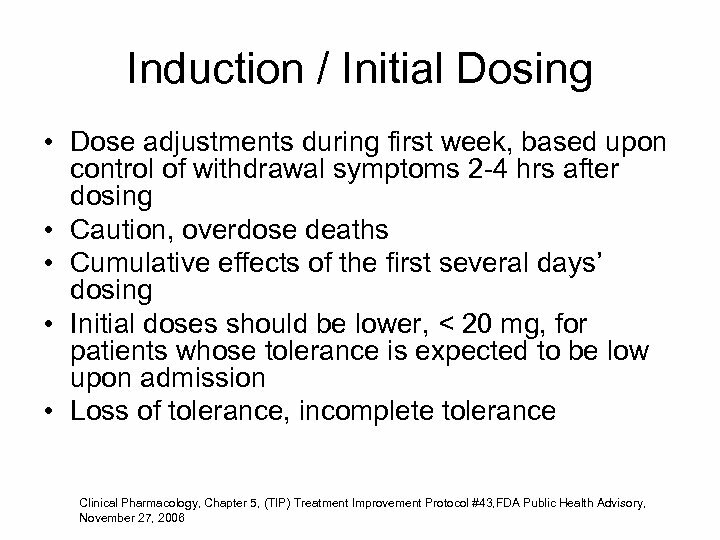 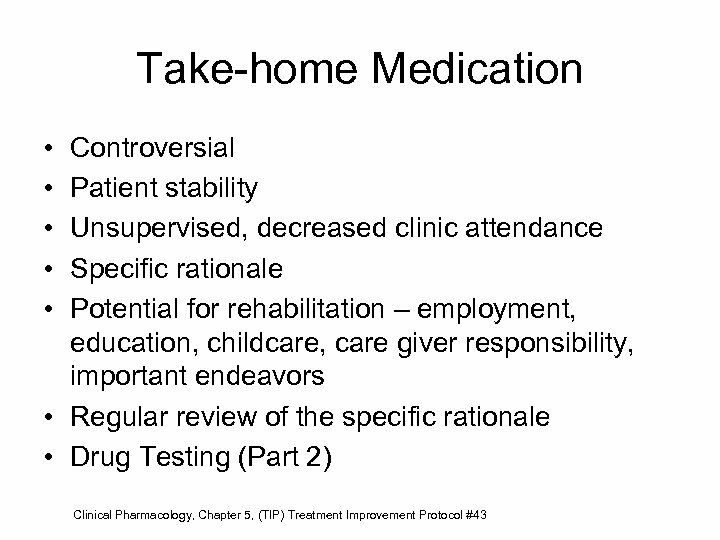 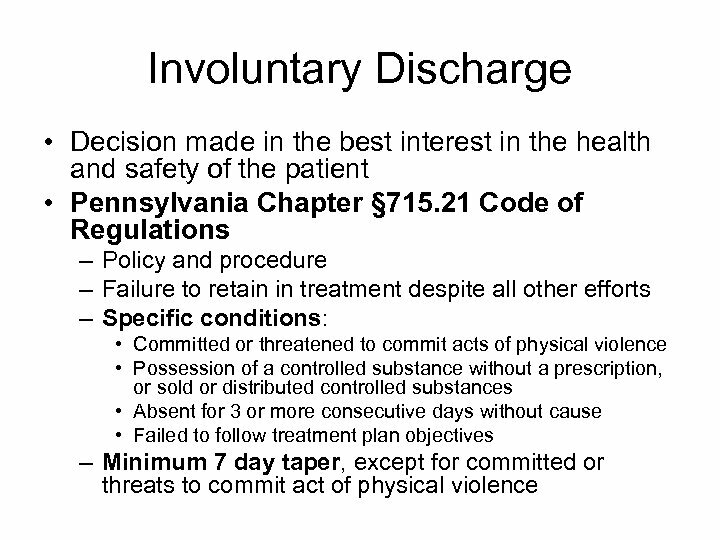 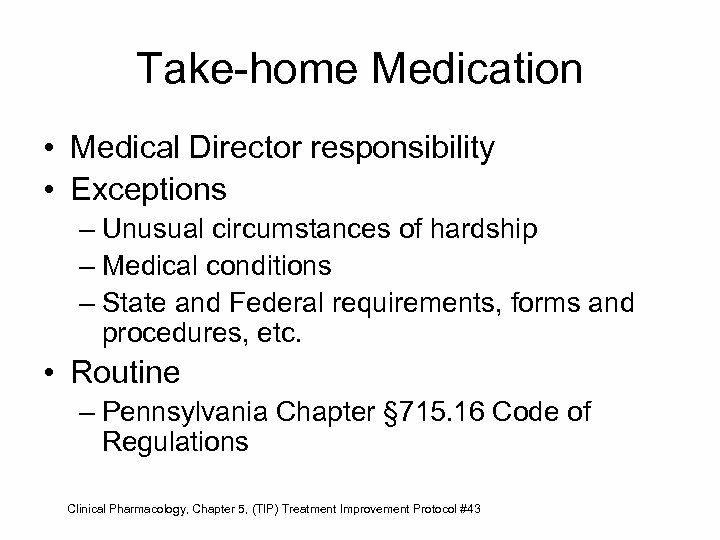 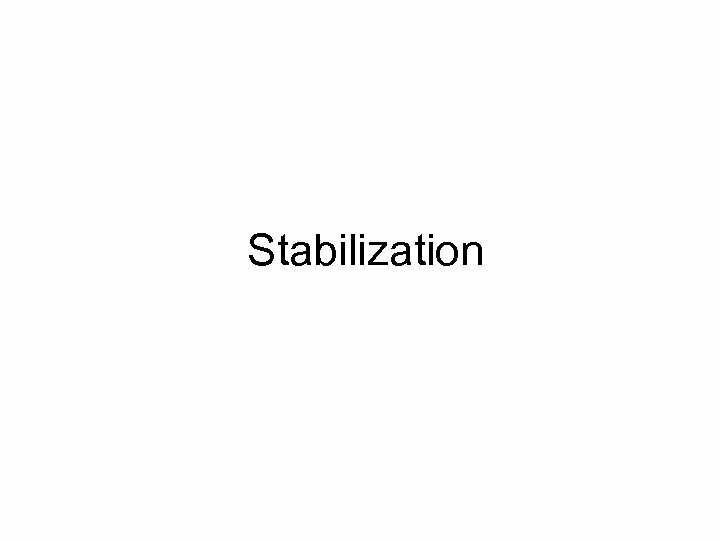 Take-home Medication • Federal Regulations (42 CFR, Part 8 § 12(i) • Pennsylvania Chapter § 715. 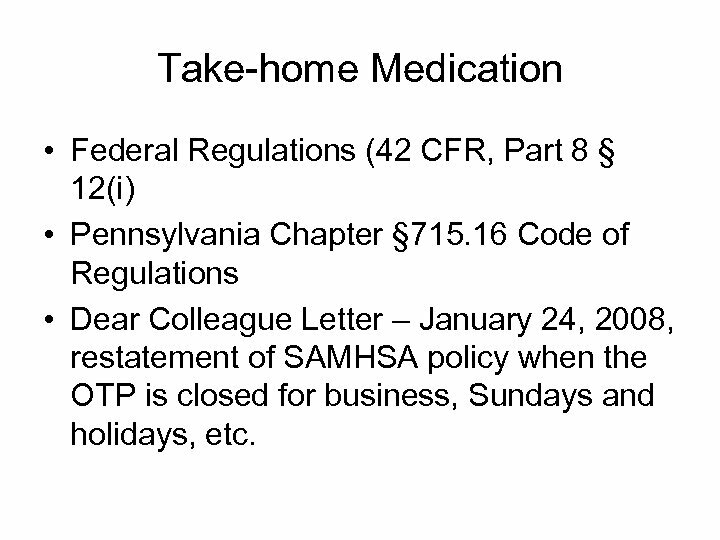 16 Code of Regulations • Dear Colleague Letter – January 24, 2008, restatement of SAMHSA policy when the OTP is closed for business, Sundays and holidays, etc.